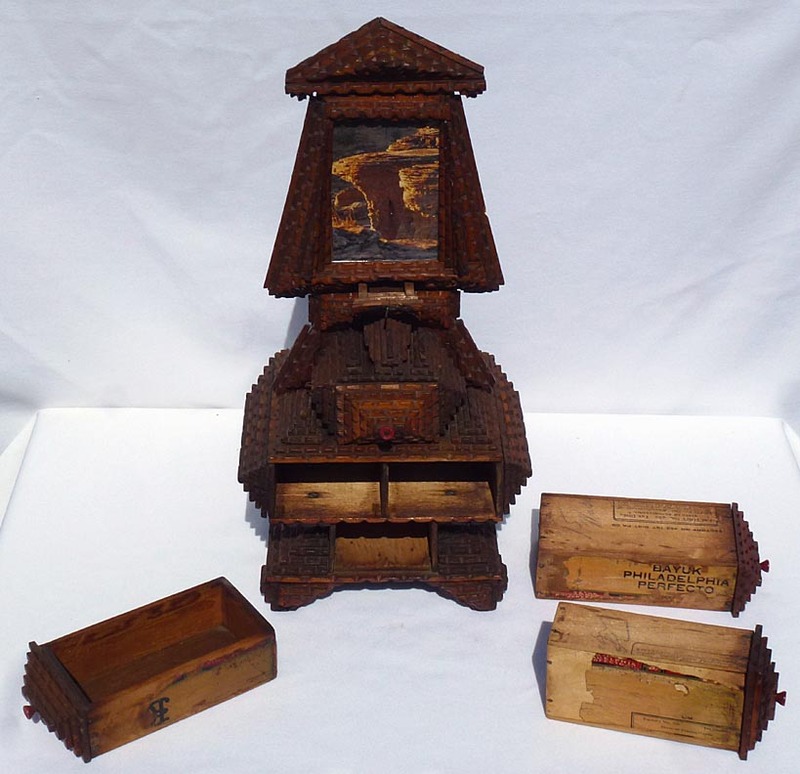 New acquisitions at Artisans folk art and antiques. Call 256-886-2809. 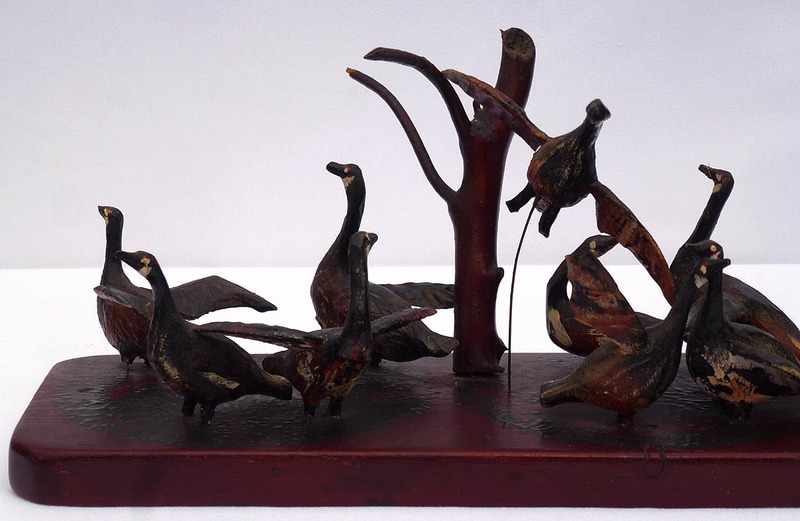 This is a wonderful assemblage of a dozen carved geese. 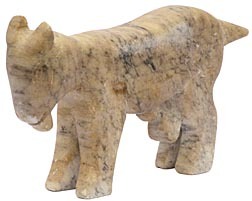 Each one is carved in a different position, and they are very lifelike and active with multicolored paint and an excellent surface. 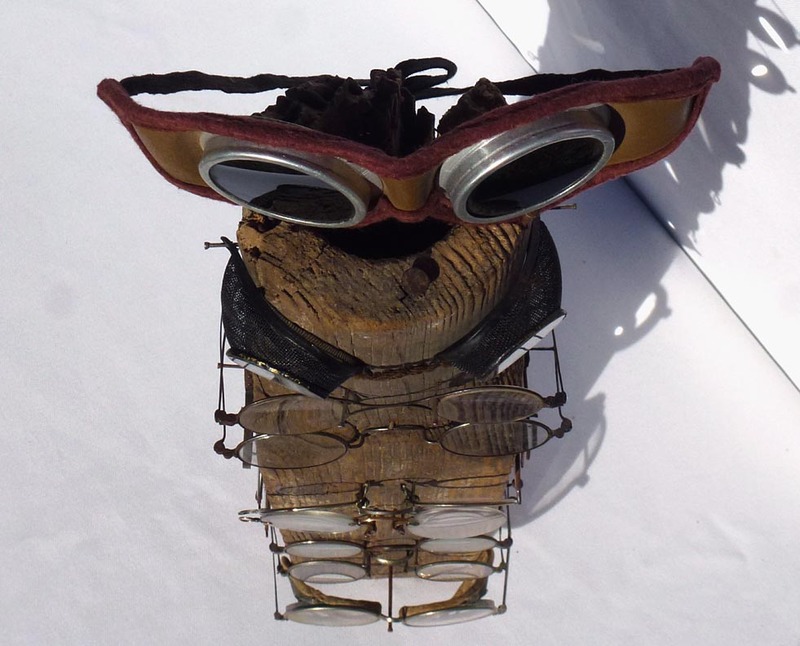 One has just taken flight and is mounted on a wire above the others with outspread wings. 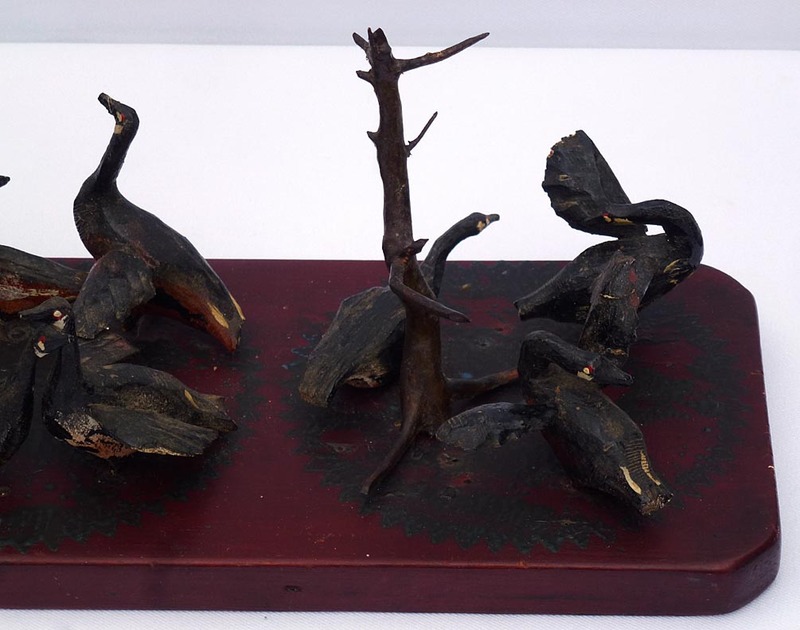 There are two trees made from branched twigs. 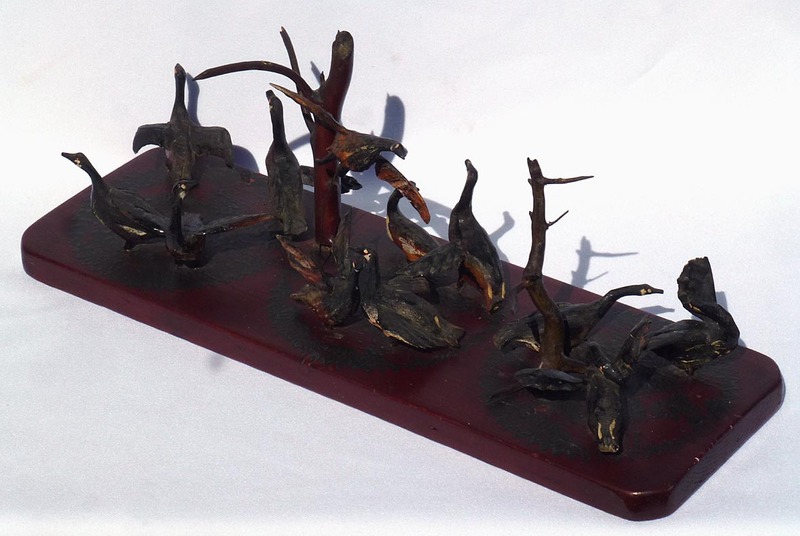 They are mounted on a wooden base that is painted deep maroon with sawtoothed black designs. 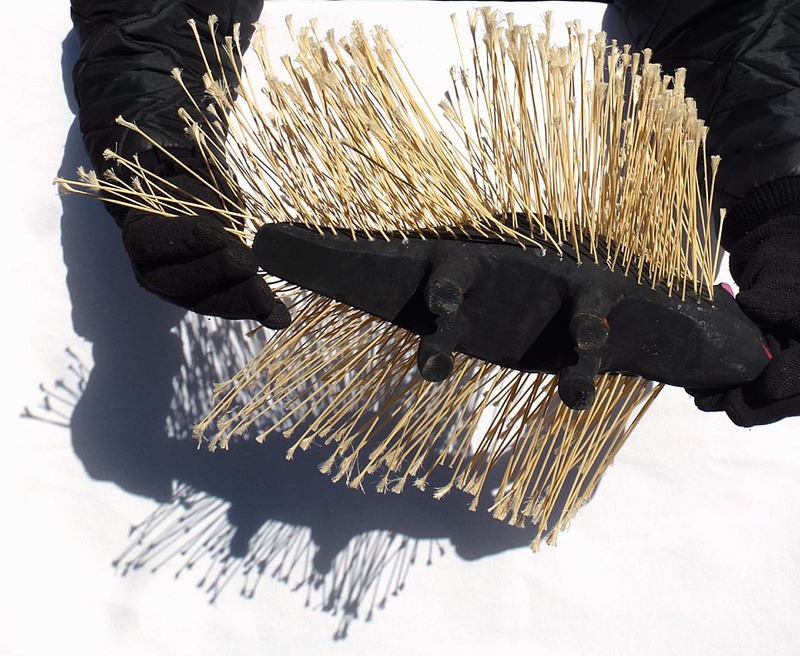 Each piece is mounted with heavy wire that goes through the base. 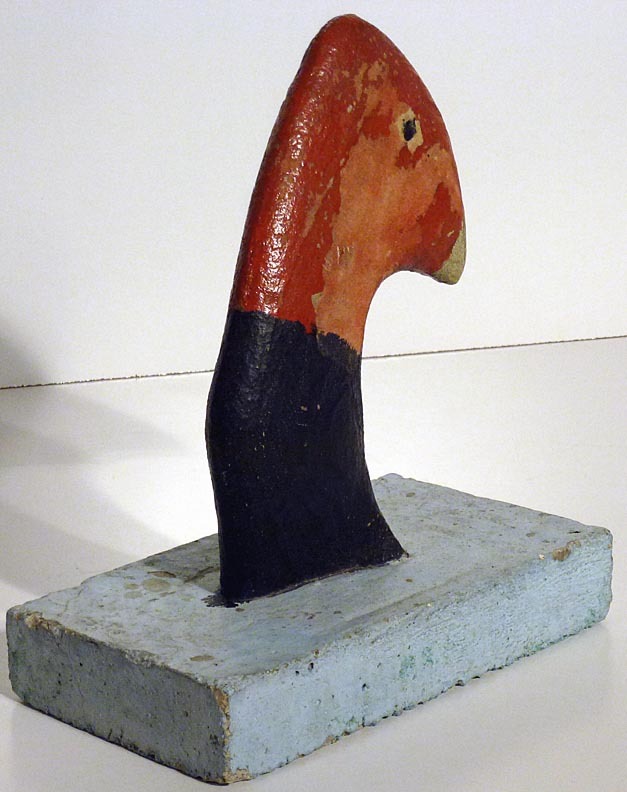 From the first half of the 20th century, it is 17 1/2" by 5 1/4" by about 6 1/4" high. 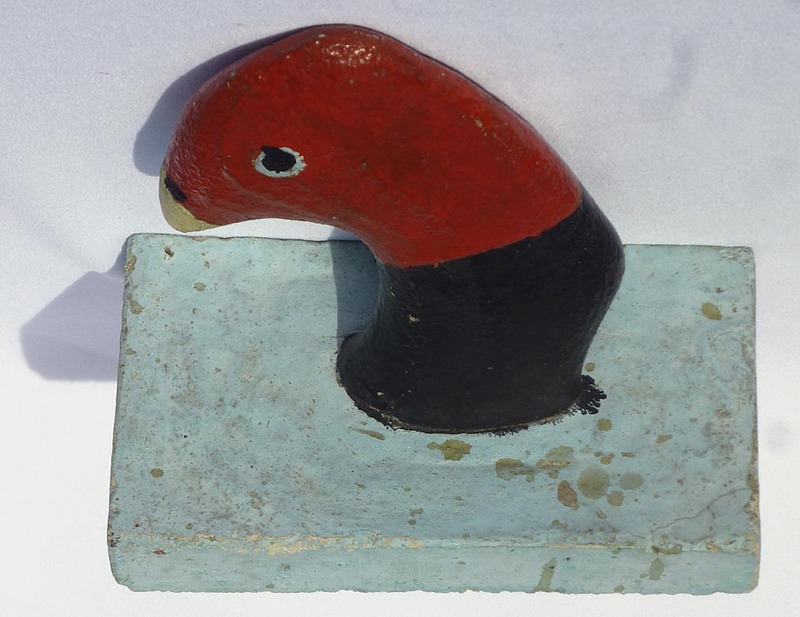 The condition is excellent - one wing tip may be missing, it's hard to tell, and one is cracked and reglued. The price is $895.00. Inventory Code: CWAW. 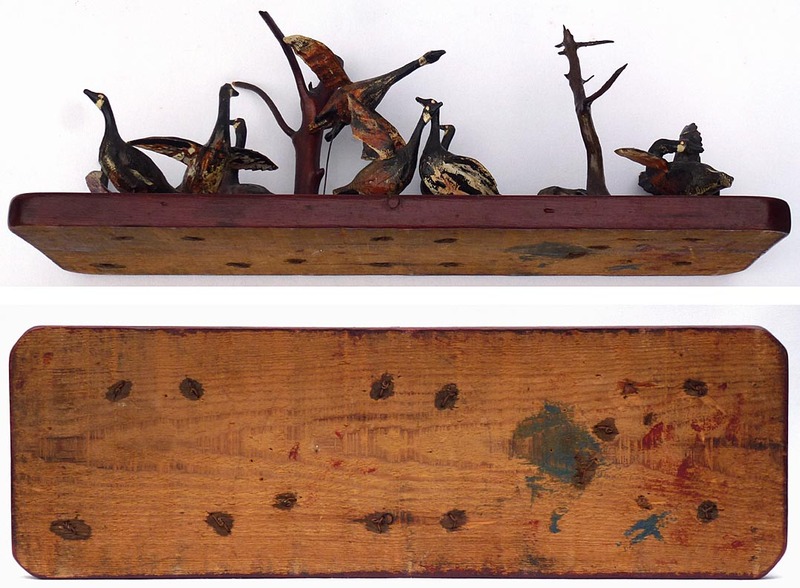 Assemblage of carved geese ... Another angle ... Third view ... Closeup ... Another closeup ... One side ... The other side ... From above ... Another view from above ... Third from above ... Fourth view from above ... One end ... The other end ... Two views from below ... With a soda can for scale. 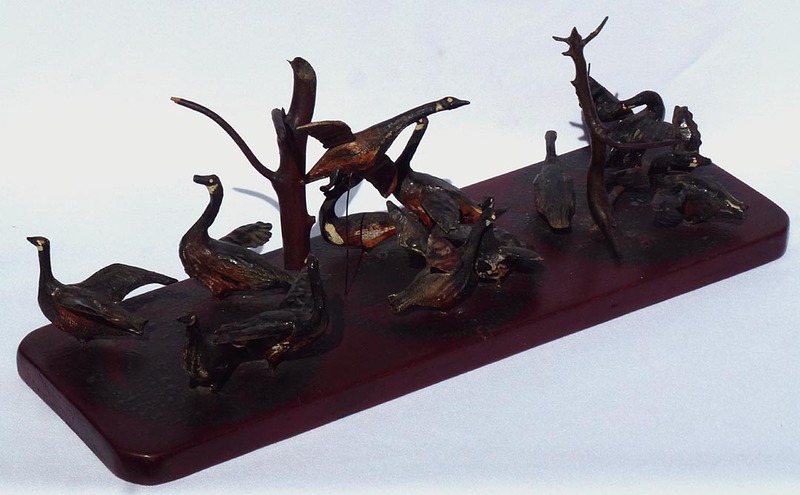 Some much larger photos: Assemblage of carved geese ... Another angle ... Third view ... Closeup ... Another closeup ... One side ... The other side ... From above ... Another view from above ... Third from above ... Fourth view from above ... One end ... The other end ... Two views from below ... With a soda can for scale. 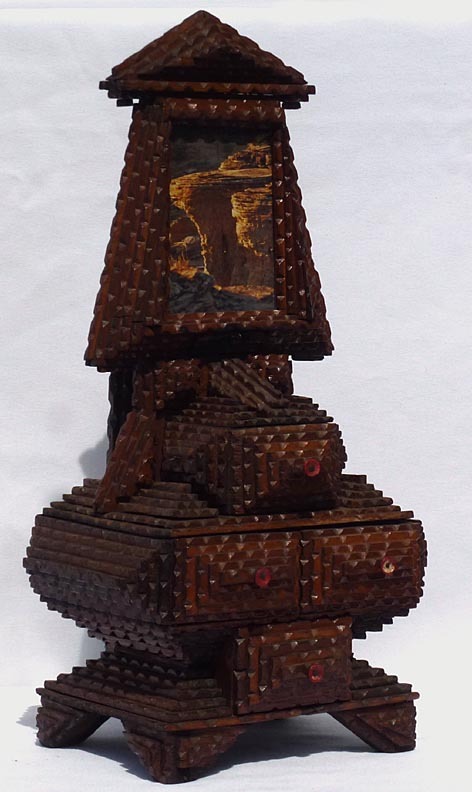 This is an exceptional tramp art combination of a box that is made to fit on a pedestal stand. 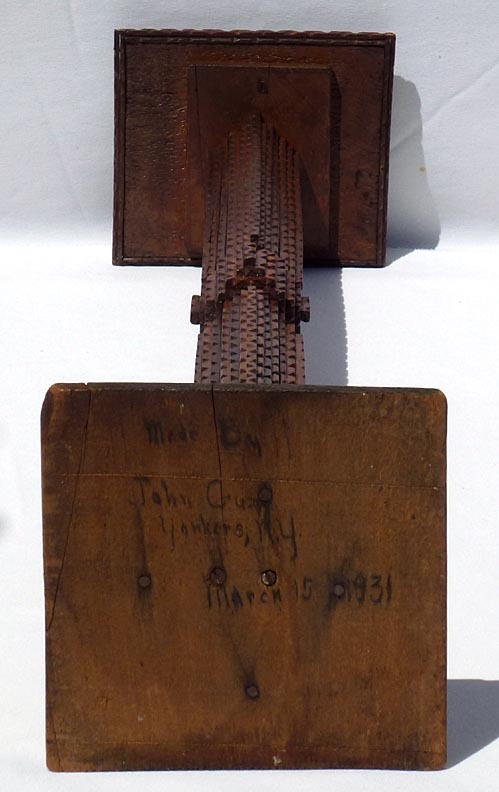 Each piece is signed on the bottom "Made by John (?) Yonkers, NY March 15 1931." They are finished in a medium brown lacquer or varnish. 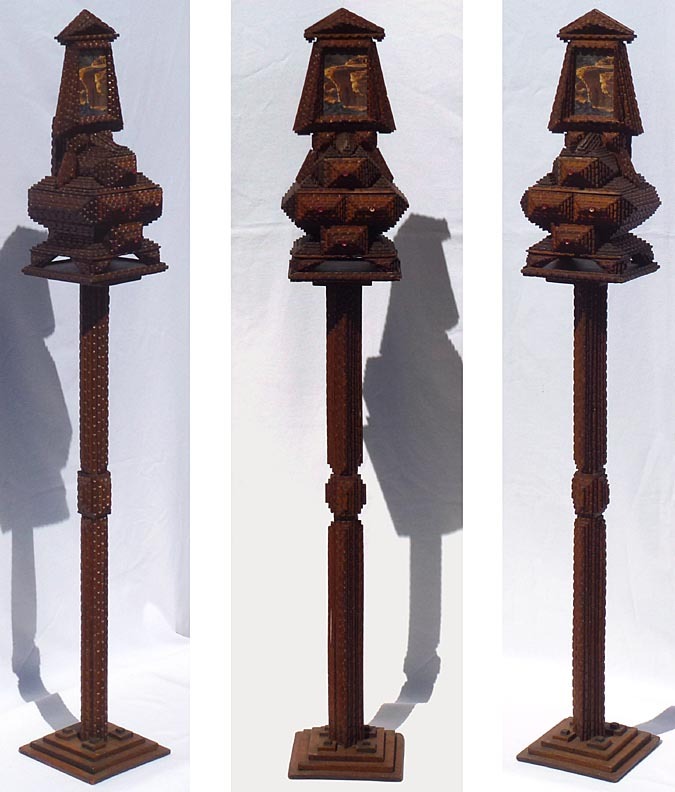 Together they stand 57 1/2" high (almost 5 feet!) by 9 1/4" wide by 8 1/2" deep. 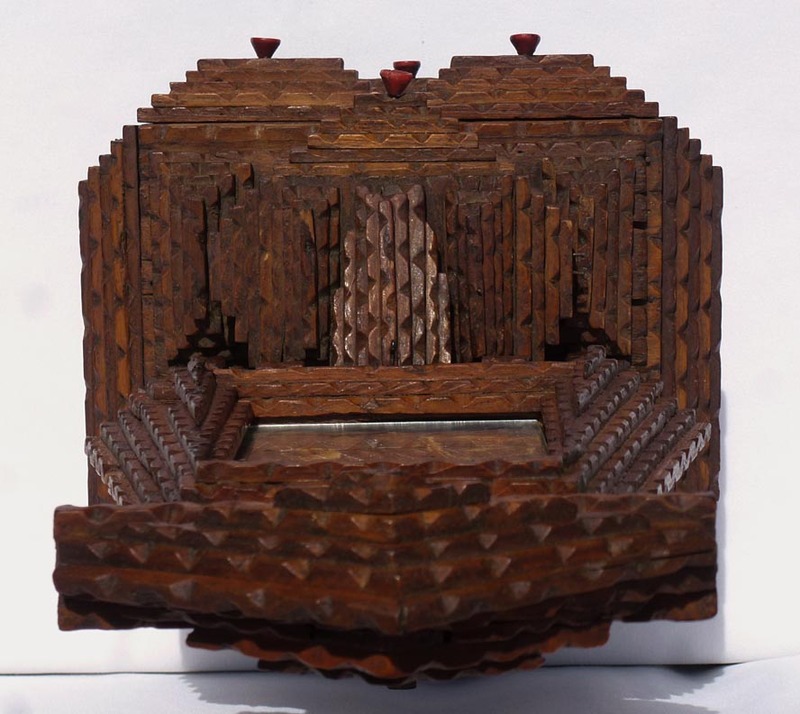 The box is nicely designed, with a frame above and some unusual features. The three lower drawers pull out as normal. 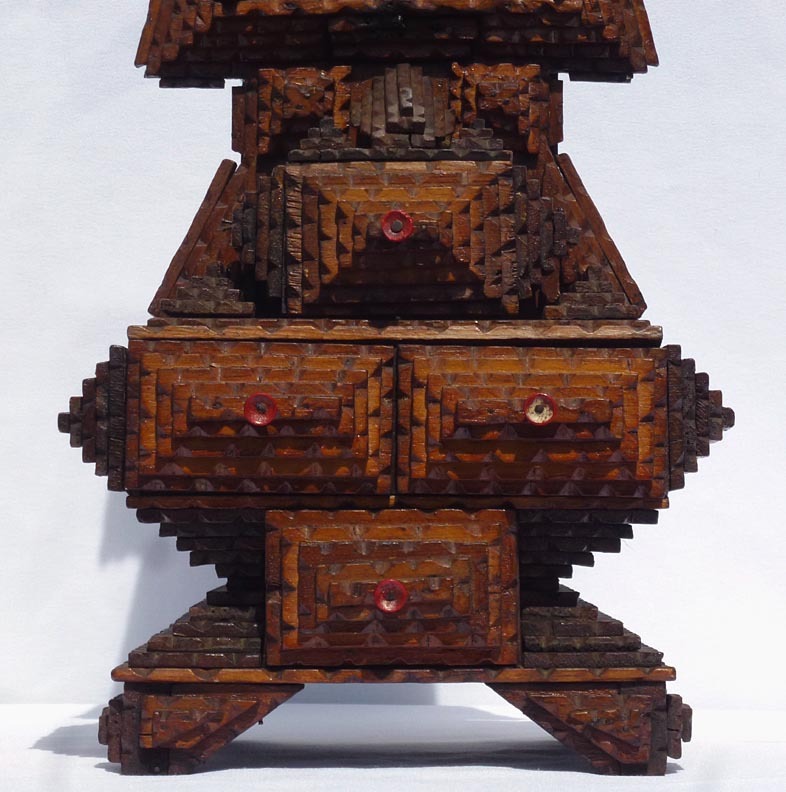 The upper drawer does not open - it appears to be a puzzle piece, and we have not been able to find the secret to unlock it. 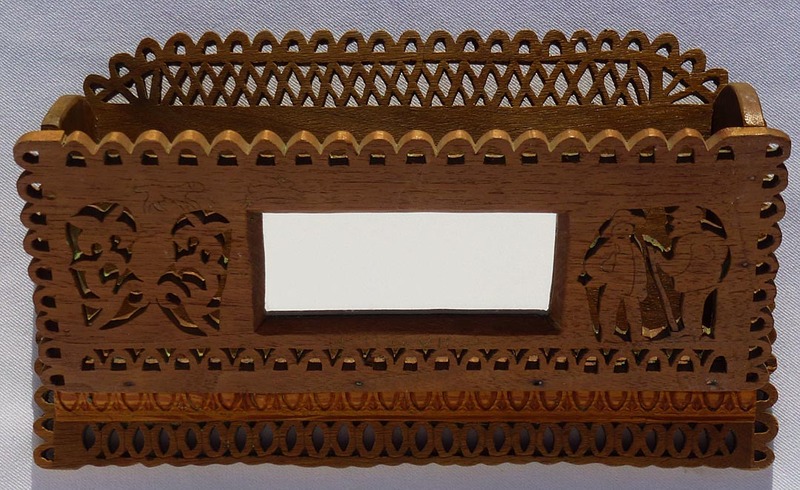 Above that, there is a tiny hidden drawer that pulls out of the bottom of the frame. 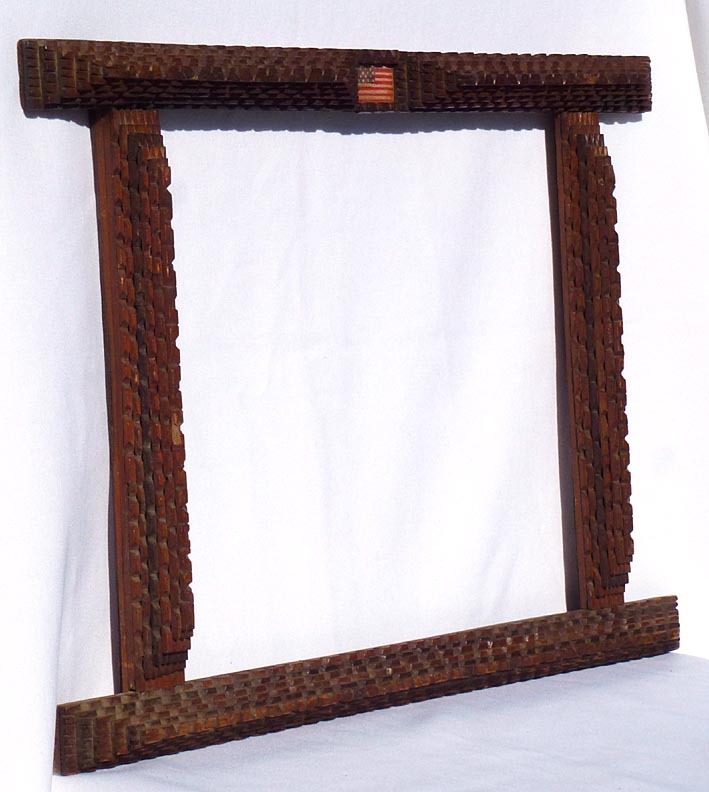 And the frame itself has one side that is built to slide out completely so you can replace the picture. There is glass in the frame. 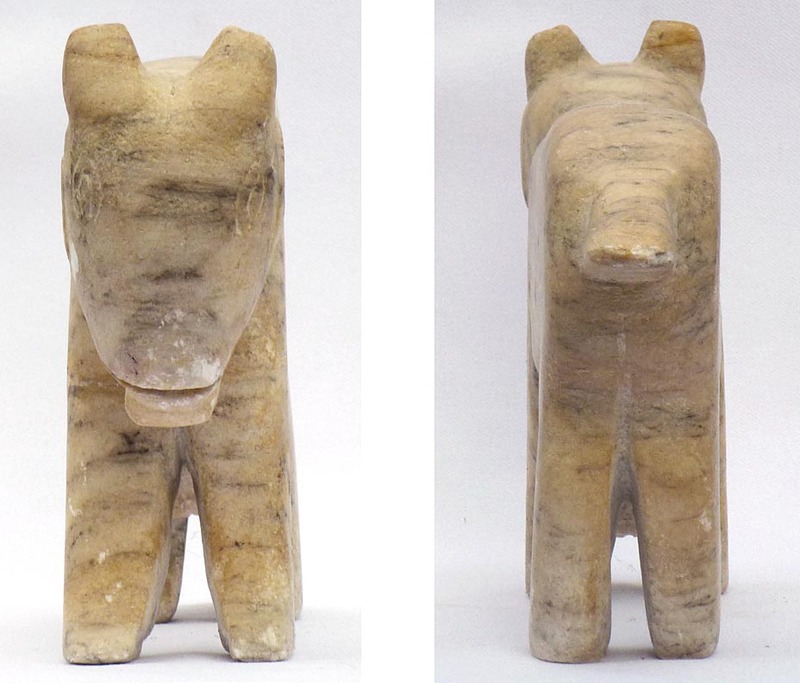 It is in excellent condition with only two or three tiny pieces lost that we can see. It is 18 3/4" high by 9 1/4" wide by 8 1/2" deep. 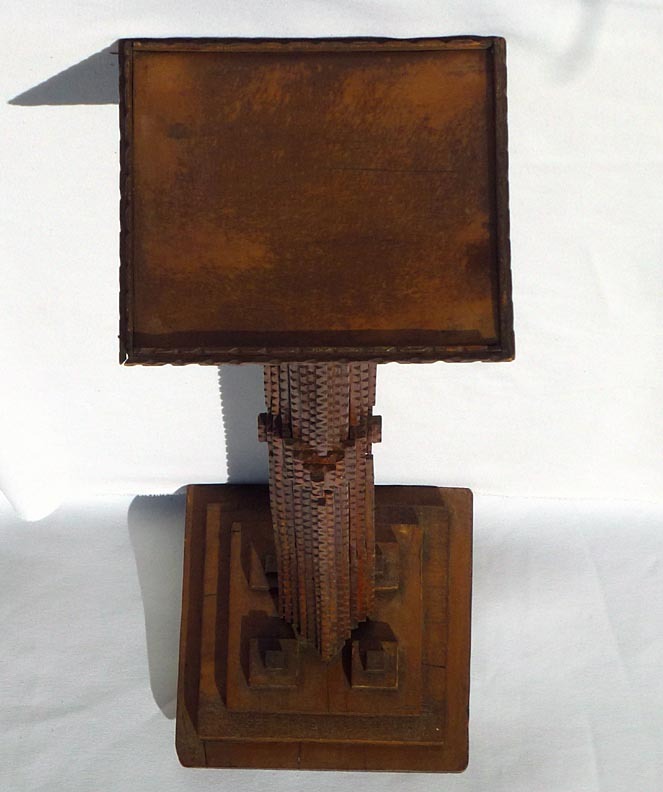 The pedestal has interesting detail on the base, and a top that is just big enough for the feet of the box. It is in very good condition with minor wear and loss around the edges and a small old break on one corner at the bottom. 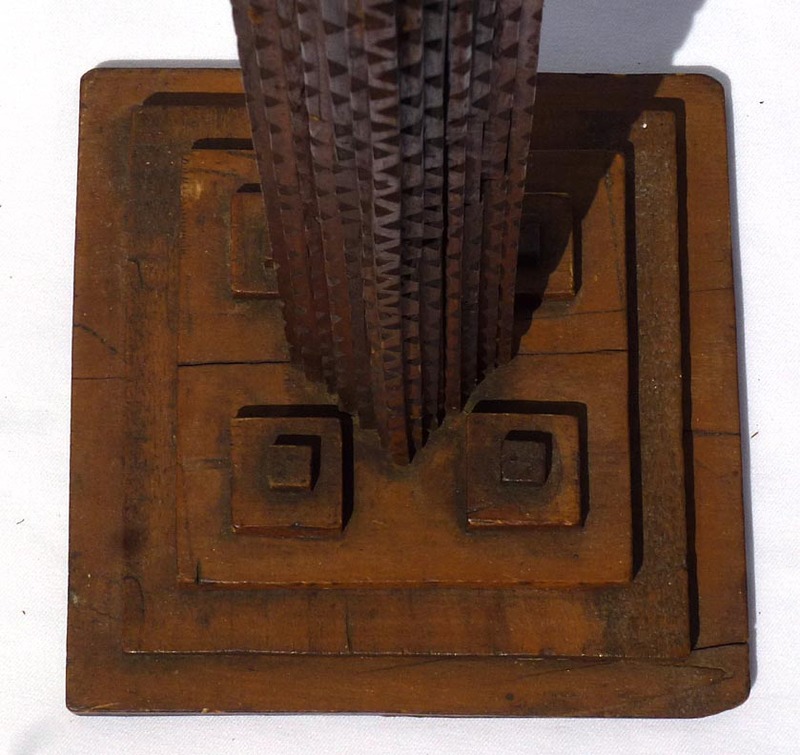 It measures 38 3/4" high by 8 1/2" square at the base. 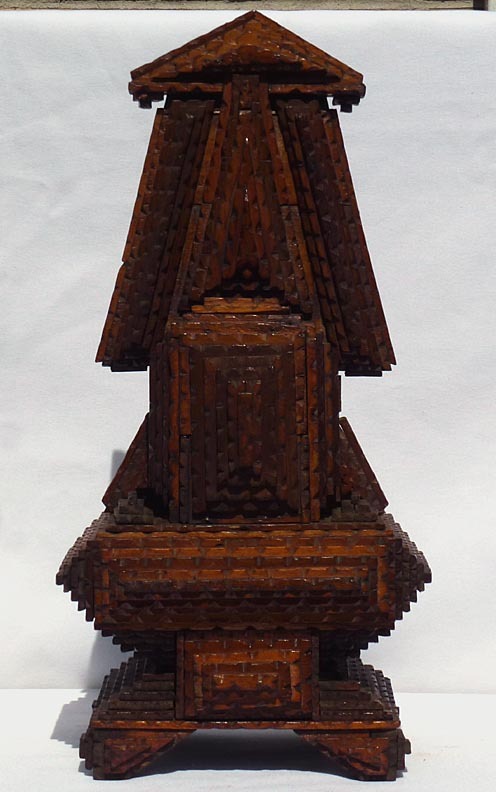 The top is 7 1/4" by 8 1/4". Inventory Code: CWPP. 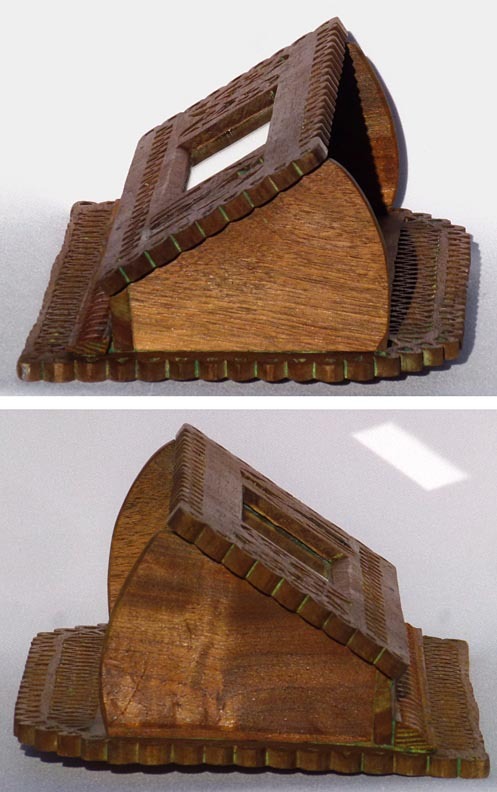 Tramp art box and pedestal, three views ... Back view ... The box ... Another angle ... A third view ... Back view ... Side views ... From above ... Another view from above ... Drawers open ... Drawers removed ... The drawers ... Closeup of tiny drawer ... Closeup of upper half ... Closeup of lower half ... Closeup from above ... The frame, with sliding side removed ... 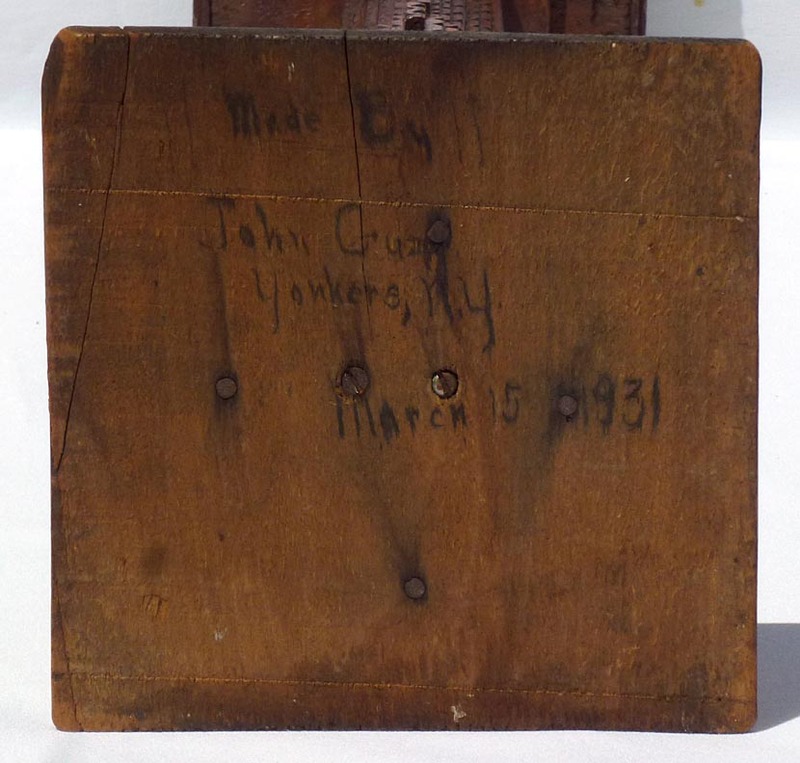 The sliding side piece ... Several views of the pedestal stand ... Closeup of the top of the pedestal ... Closeup of the base ... Another view of the base ... Closeup of the middle ... From above ... From below ... Inscription on the bottom ... With a yardstick and soda can for scale. 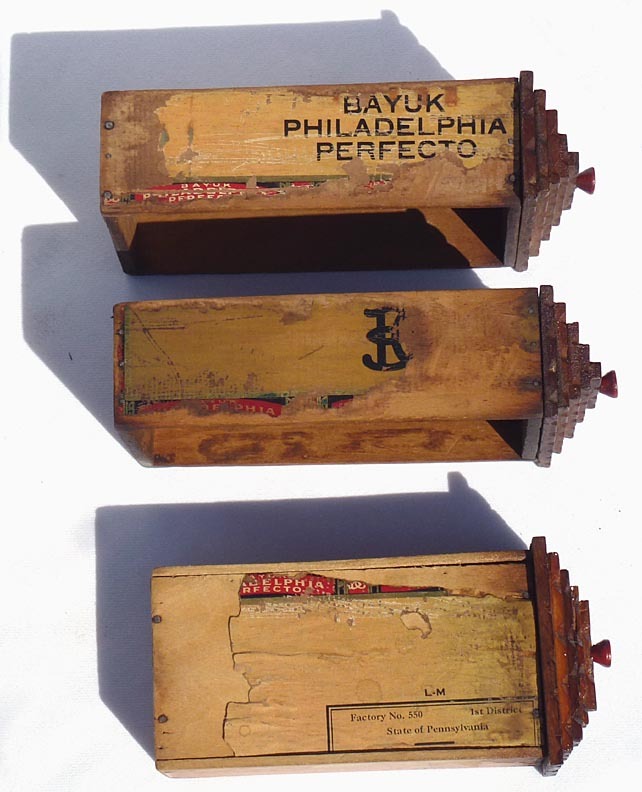 Some much larger photos: Tramp art box and pedestal, three views ... Back view ... The box ... Another angle ... A third view ... Back view ... Side views ... From above ... Another view from above ... Drawers open ... Drawers removed ... The drawers ... Closeup of tiny drawer ... Closeup of upper half ... Closeup of lower half ... Closeup from above ... 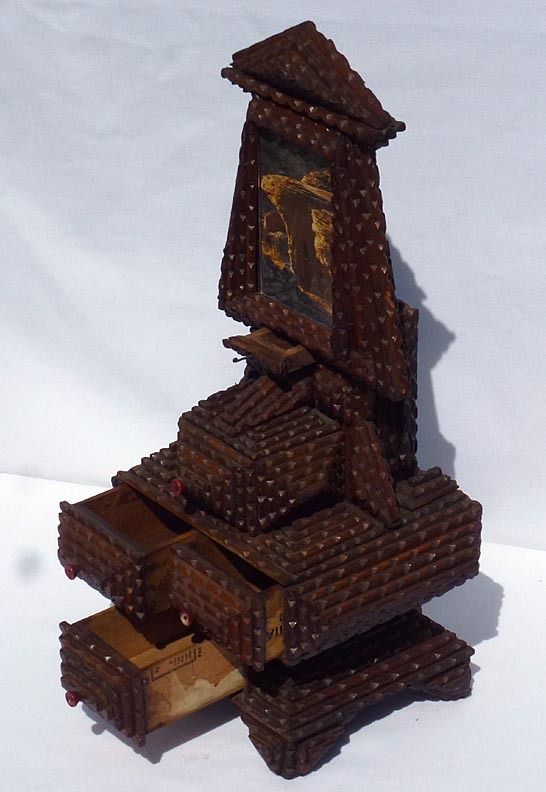 The frame, with sliding side removed ... 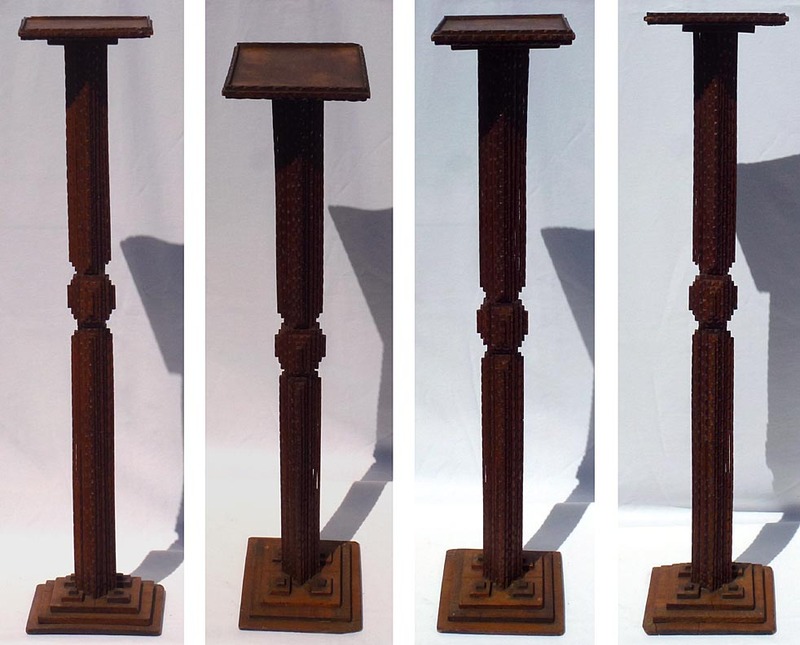 The sliding side piece ... Several views of the pedestal stand ... Closeup of the top of the pedestal ... Closeup of the base ... Another view of the base ... Closeup of the middle ... From above ... From below ... Inscription on the bottom ... With a yardstick and soda can for scale. 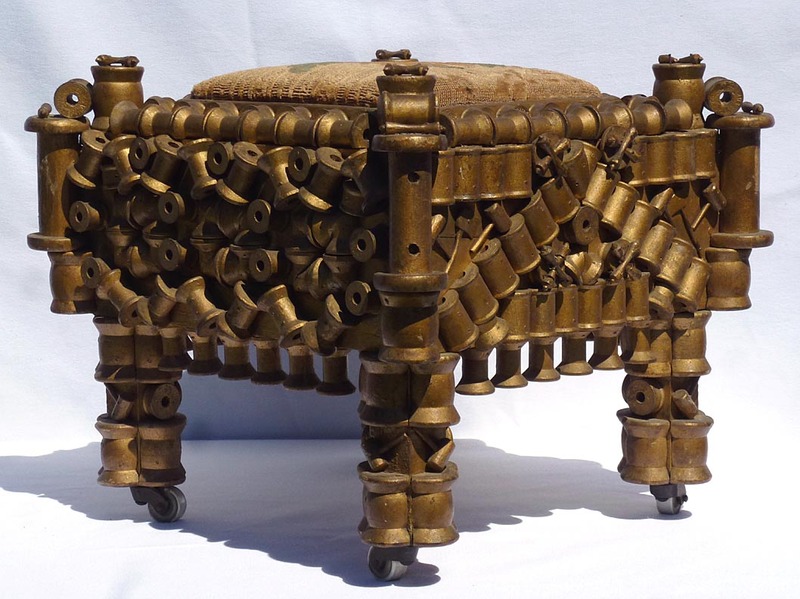 This footstool is one of the nicest examples of spool furniture we have seen. 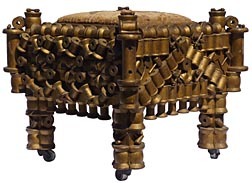 Each side is decorated in a different, well laid-out pattern. 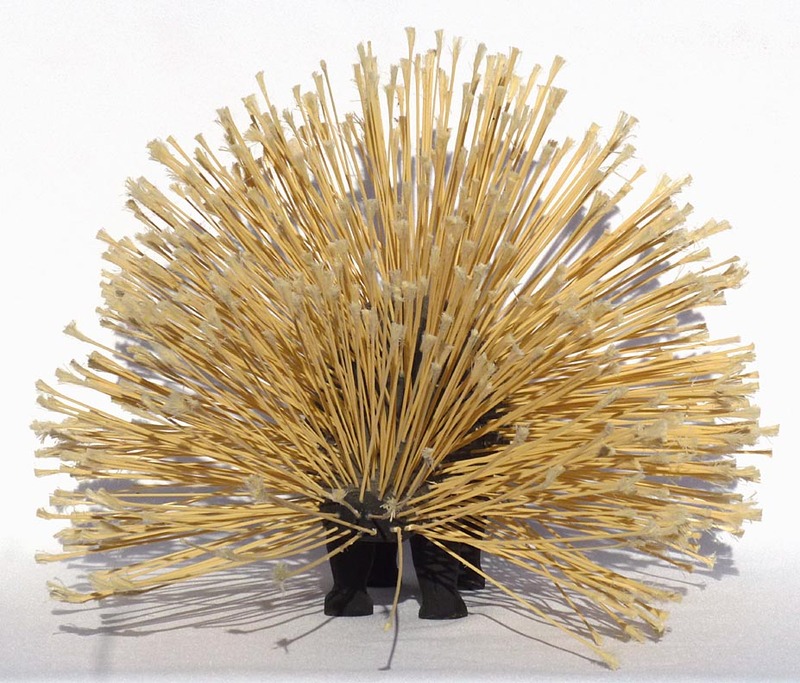 There are many different sizes and shapes of spools. 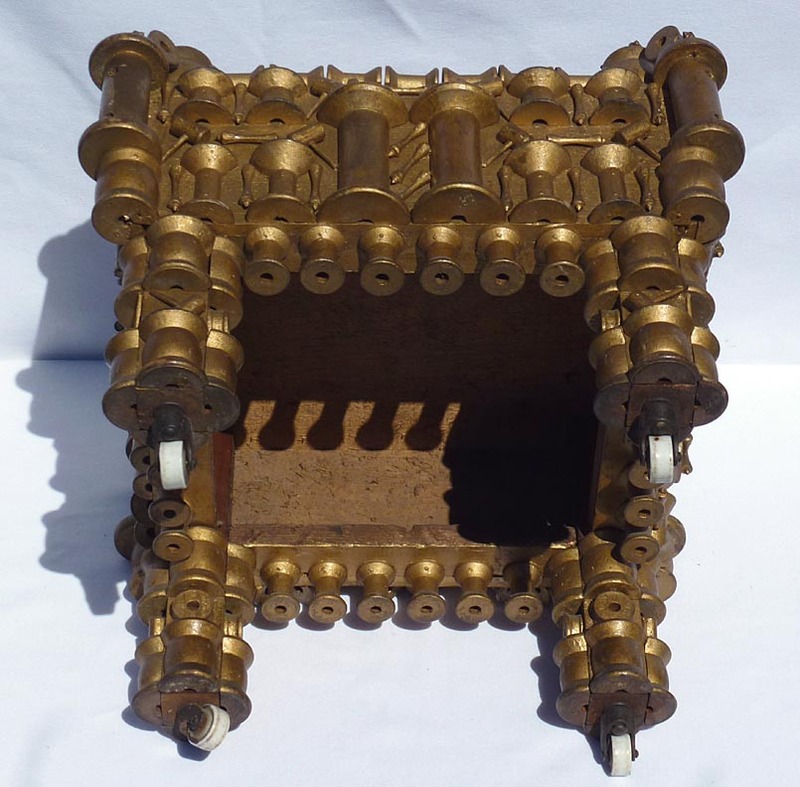 Some of the spools were cut on the diagonal and pieced back together in unusual designs. 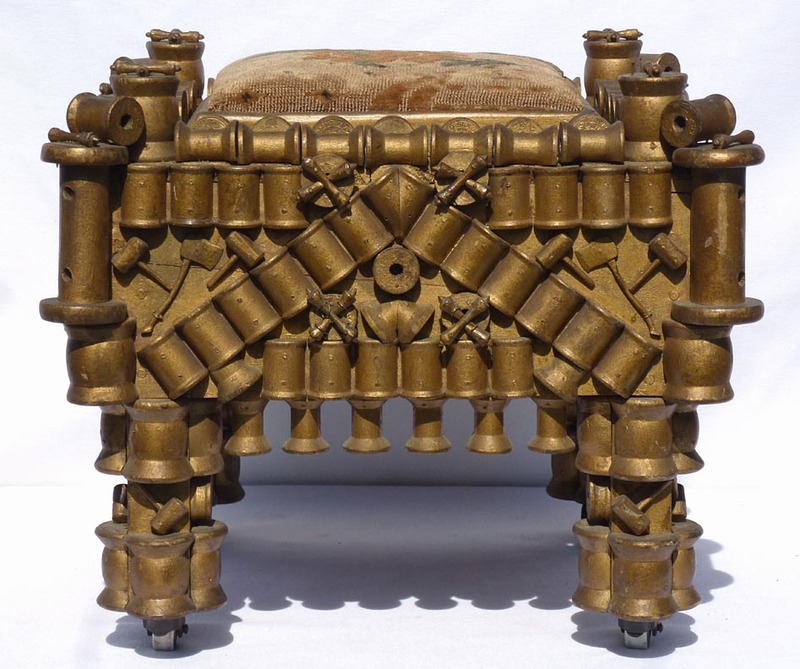 In addition there are small hand carved gavels, scrolls, and axes worked in, possibly fraternal symbols. 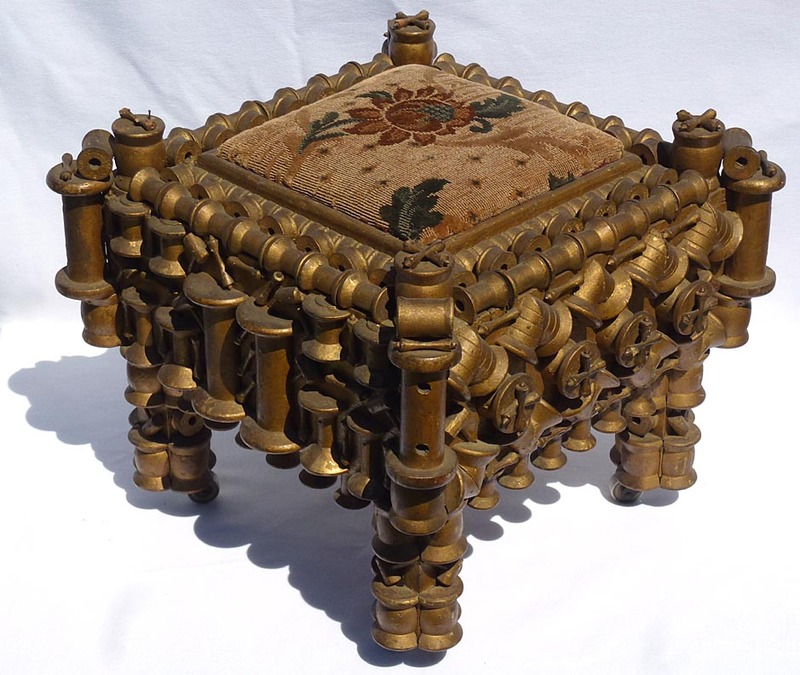 It is painted gold, the top is upholstered, and there are small casters on the feet. 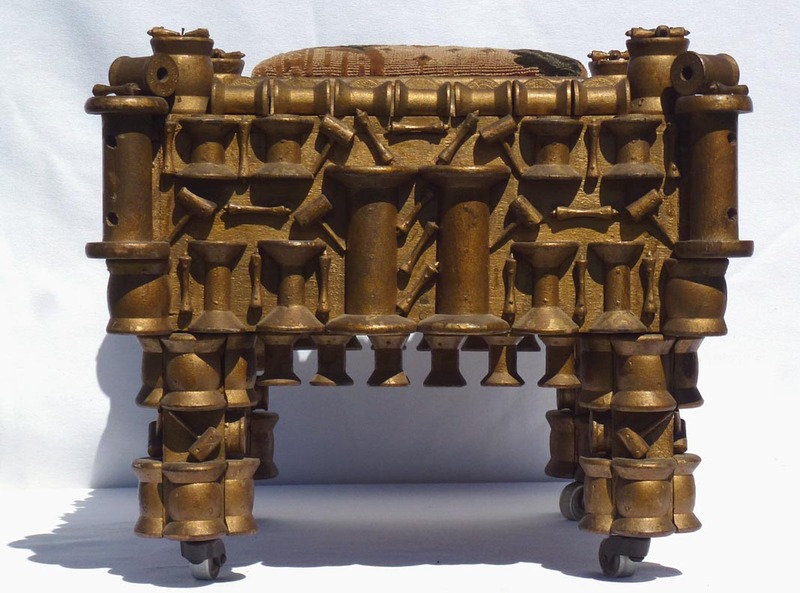 Probably from the 1920's or 30's, it is in excellent, near mint condition. There is one small scroll missing and a second one cracked. 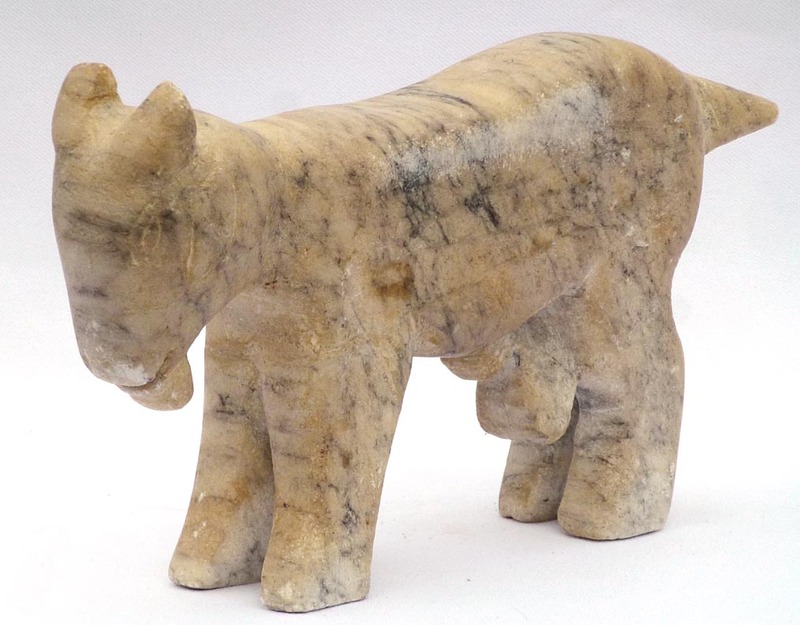 The size is 12 1/2" high by 14 1/2" by 14 1/2". The price is $450.00. 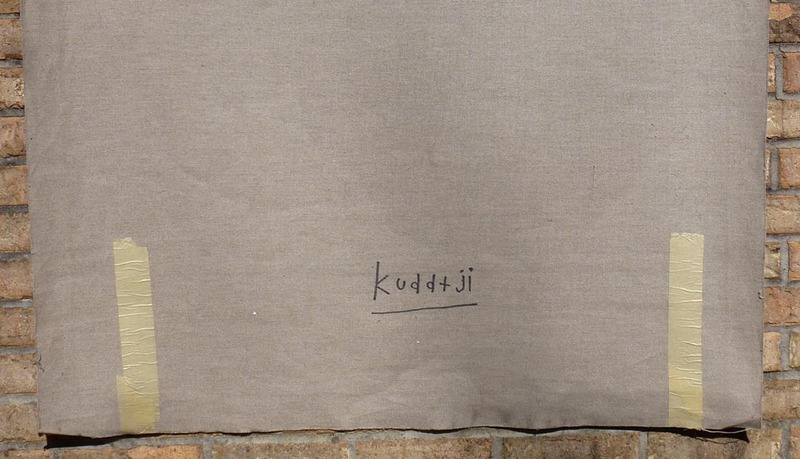 Inventory Code: CWTA. Spool stool ... Another angle ... One side ... Second side ... Third side ... Fourth side ... From above ... Another view from above ... From below ... With a soda can for scale. 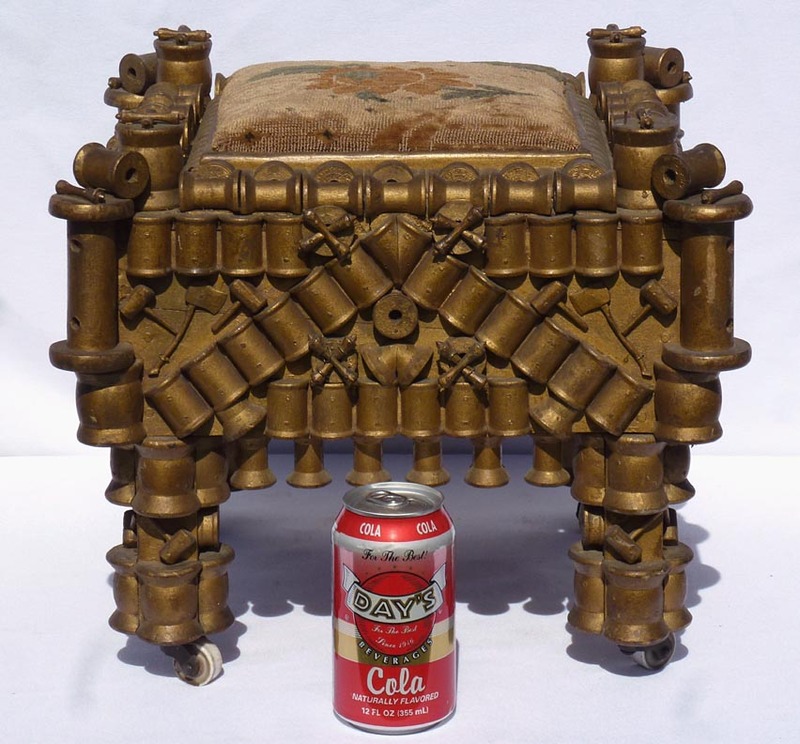 Some much larger photos: Spool stool ... Another angle ... One side ... Second side ... Third side ... Fourth side ... From above ... Another view from above ... From below ... With a soda can for scale. 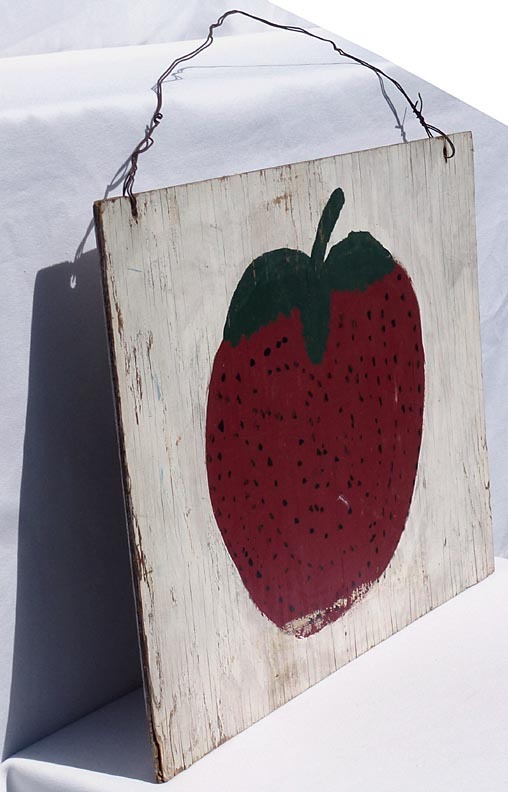 This is a two sided strawberry sign painted on plywood with a wire hanger. 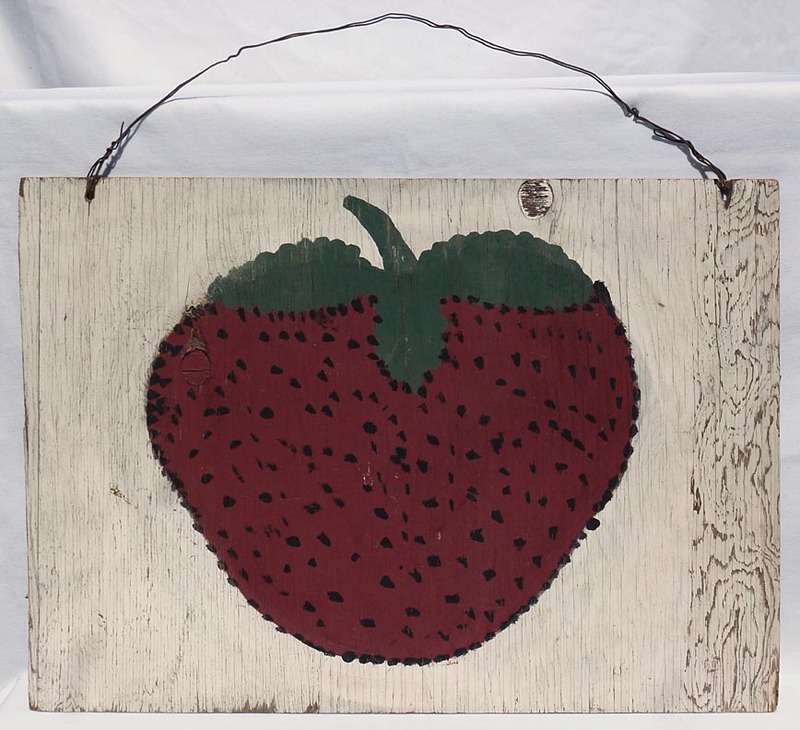 The berries are a little different on each side, but obviously in the same paint and by the same hand. 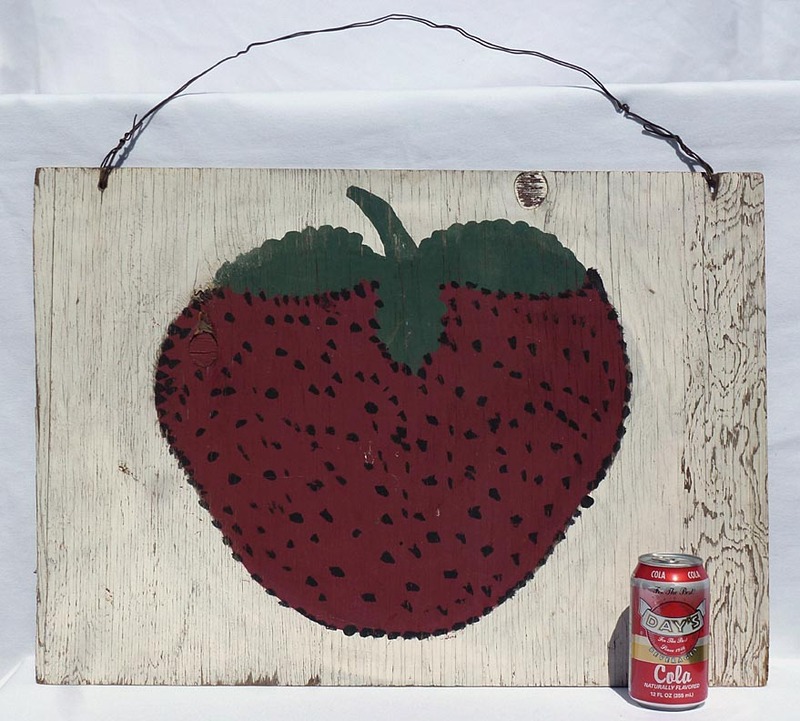 The sign itself measures 25 1/2" wide by 18" high, 23 1/2" high including the hanger. 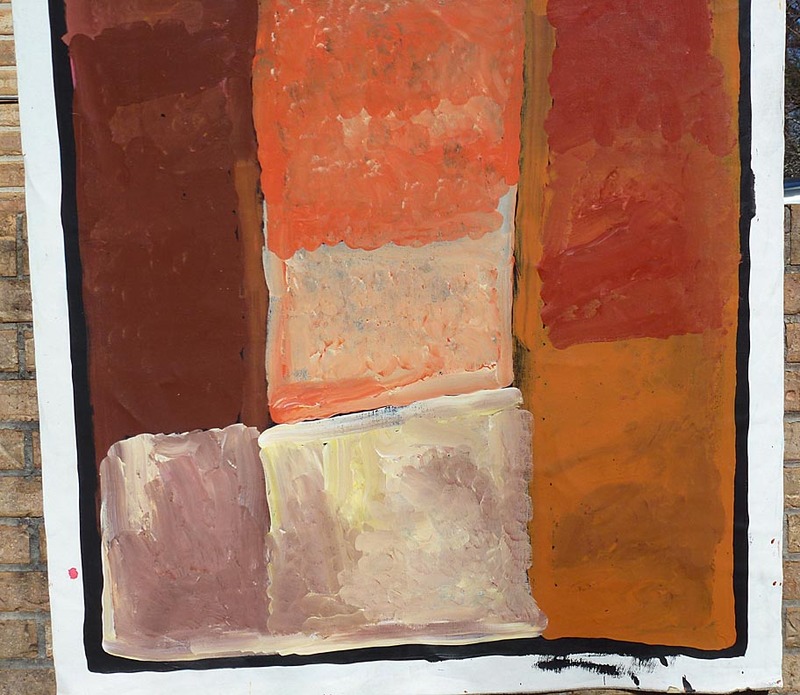 It is not quite cut square, being a little wider at the top than the bottom. 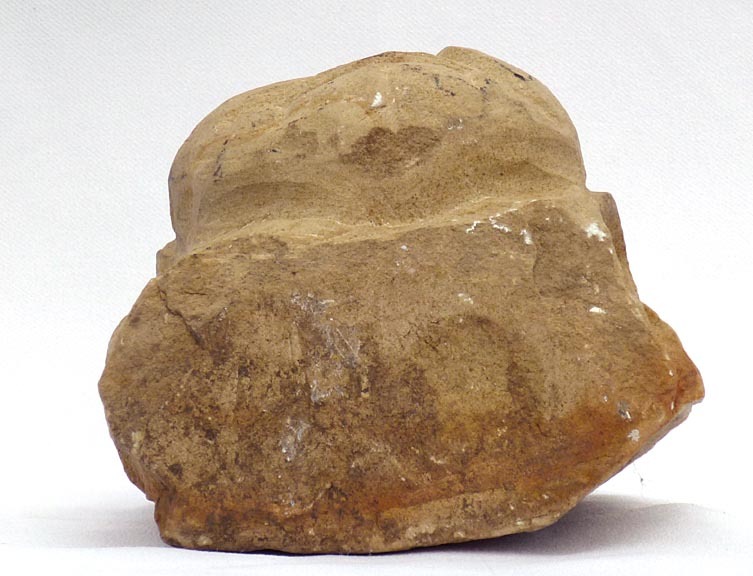 It is likely from the last quarter of the 20th c., in good, weathered condition from outdoor use. The price is $175.00. Inventory Code: CWTO. 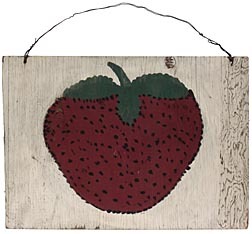 Strawberry sign ... The other side ... Side view ... Another side view ... With a soda can for scale. 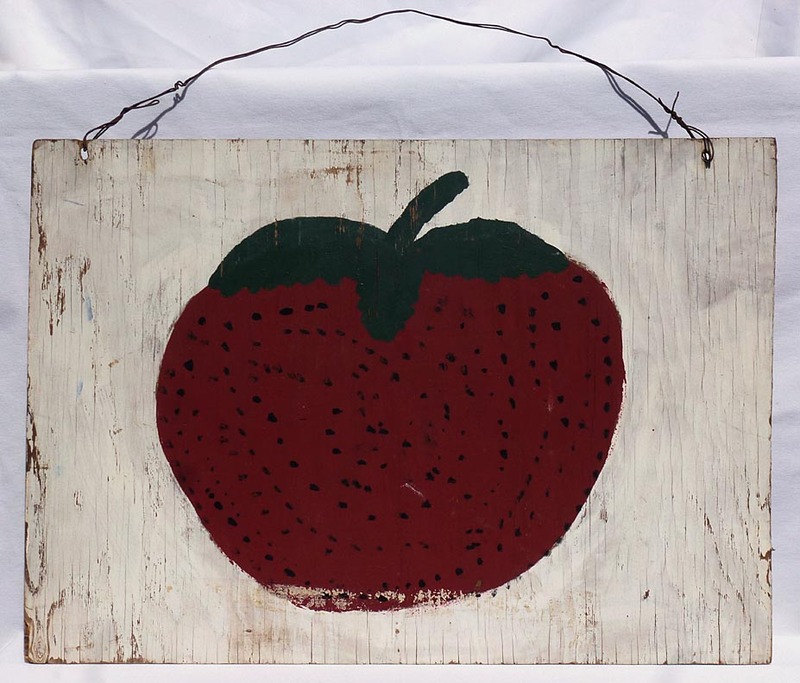 Some much larger photos: Strawberry sign ... The other side ... Side view ... Another side view ... With a soda can for scale. 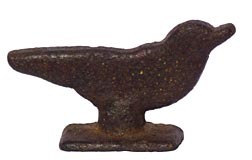 This is a cast iron shooting gallery target in the form of a bird. 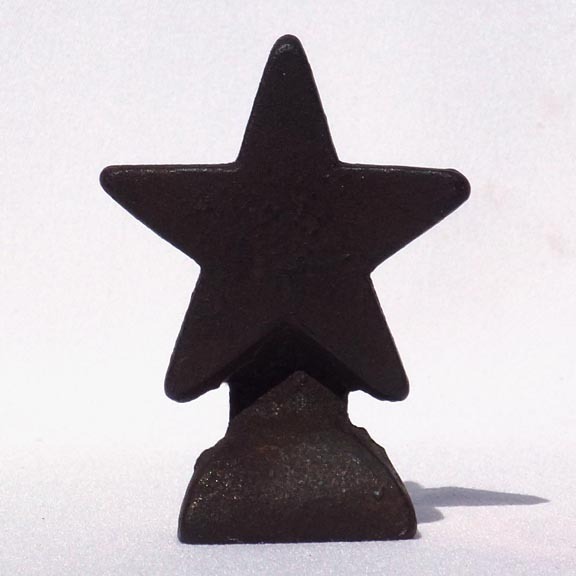 It has a pitted, dark oxidized surface and measures 5 3/4" long by 3" high by 1 1/2" deep. It is from the early 1900's, in very good, used and shot condition. The price is $150.00. Inventory Code: CWPH. Bird shooting gallery target, with a soda can for scale ... Back view ... Side views. 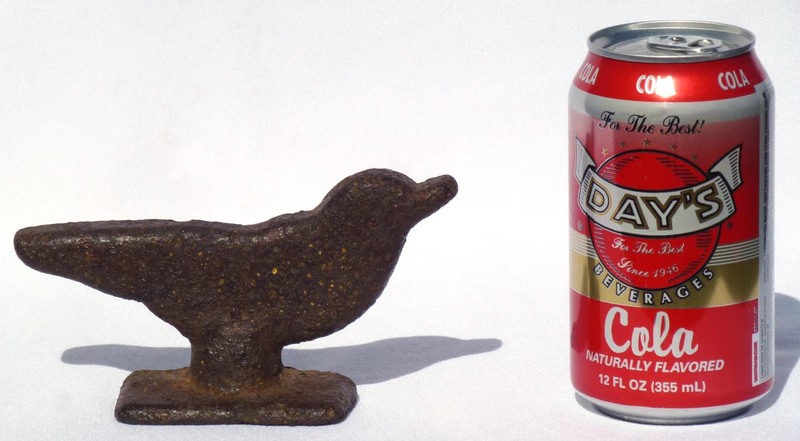 Some much larger photos: Bird shooting gallery target, with a soda can for scale ... Back view ... Side views. 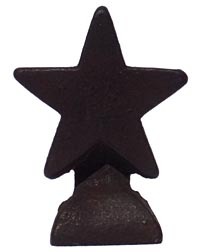 This is a star shaped iron shooting gallery target with a good, very dark, smooth oxidized surface. 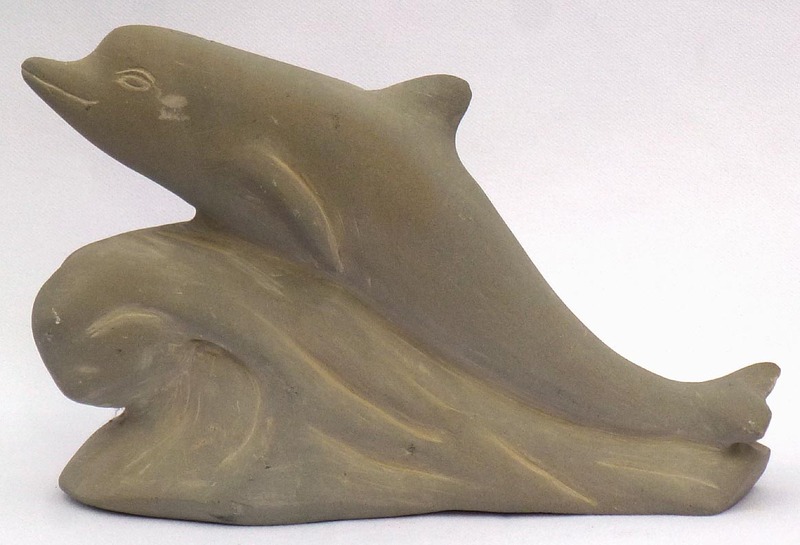 It stands 3 1/4" tall by 2 1/2" wide by 1" deep, in excellent condition, from the early 1900's. Inventory Code: CWPW. 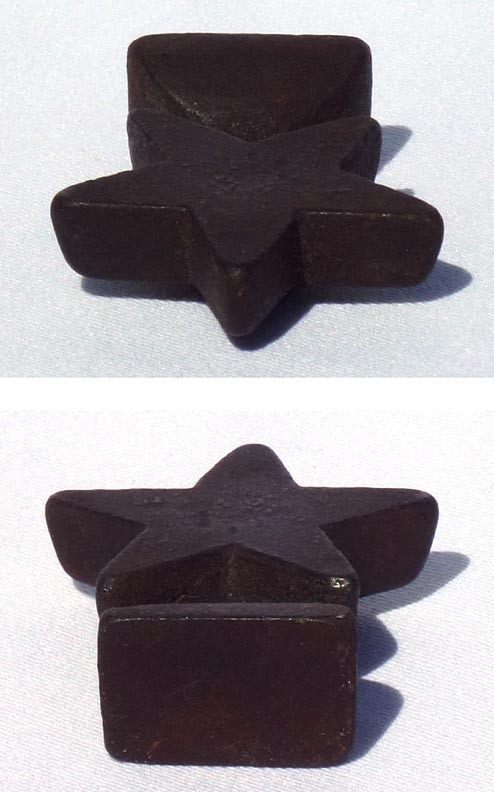 Cast iron star target ... Back view ... Side views ... From above and below ... With a soda can for scale. 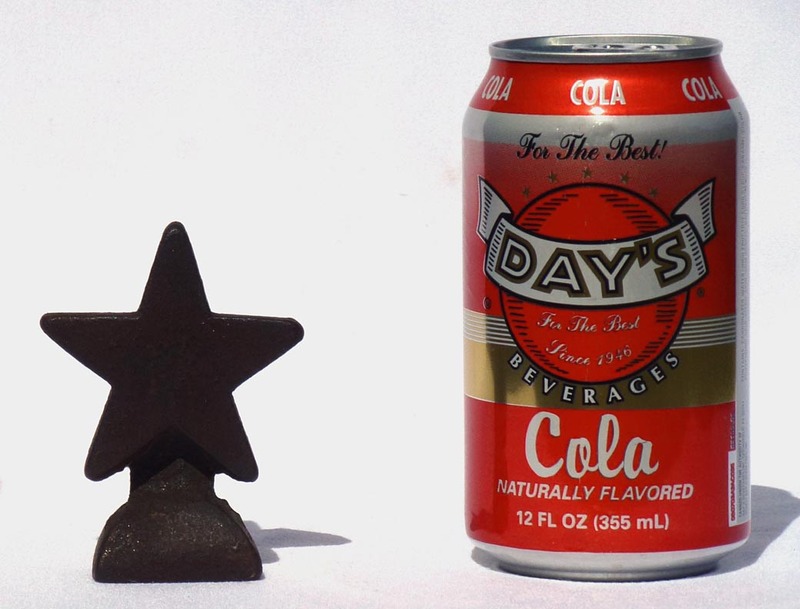 Some much larger photos: Cast iron star target ... Back view ... Side views ... From above and below ... With a soda can for scale. 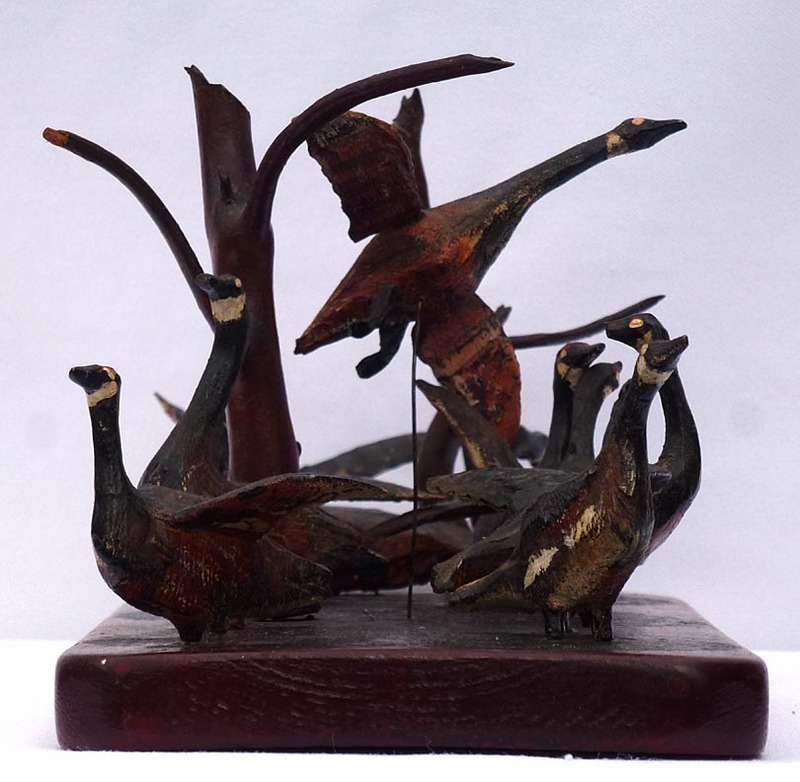 An extraordinary, large, extremely detailed carved and inlaid whimsey with a fraternal theme. 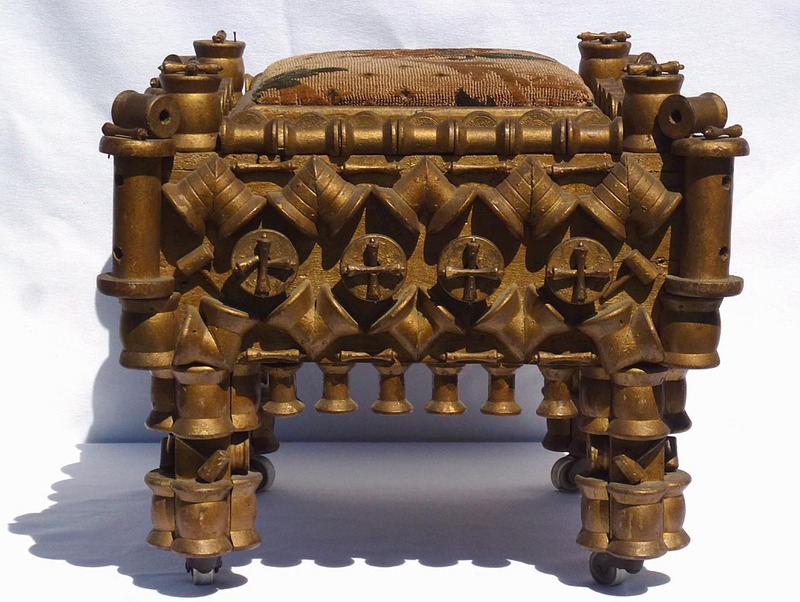 It is over 49" long, decorated on the sides and front with Crosses, Ankhs, stars, hearts, Bibles, scrolls, spears, and other Masonic, Shriner, Eastern Star, and Odd Fellows symbols. 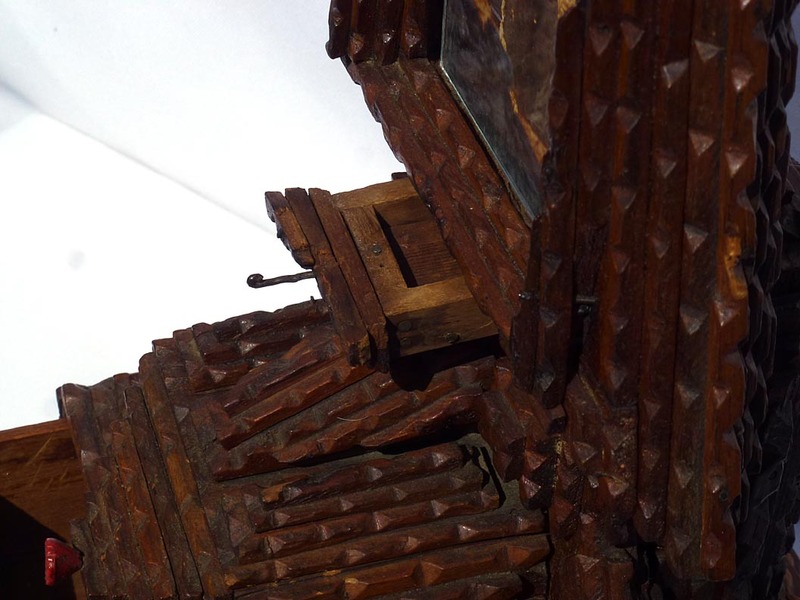 Each section is held together with carved links; and the entire carving is made from one piece of wood. 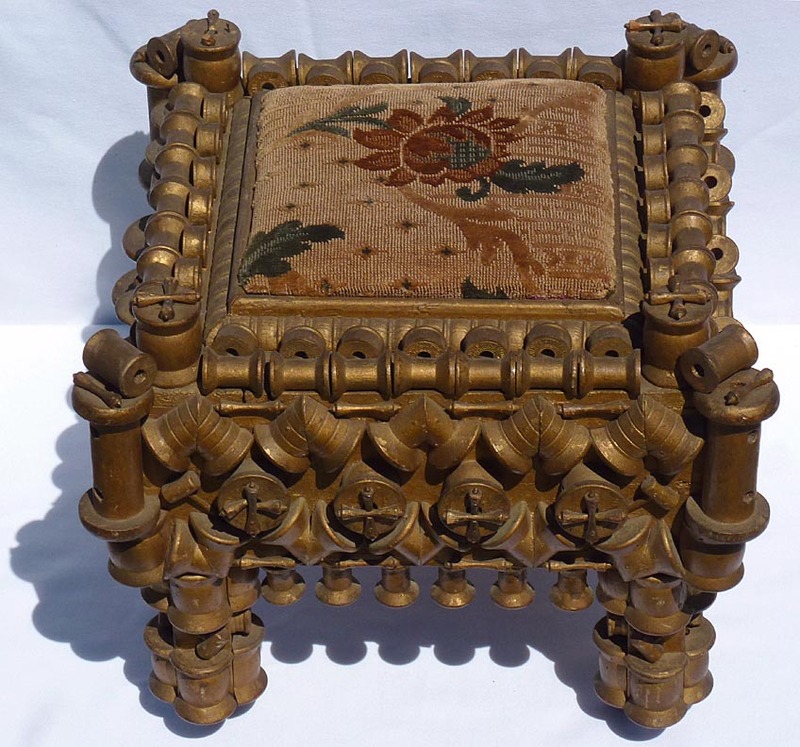 There is one carved ball in cage, relief carving, and lots of inlaid work. 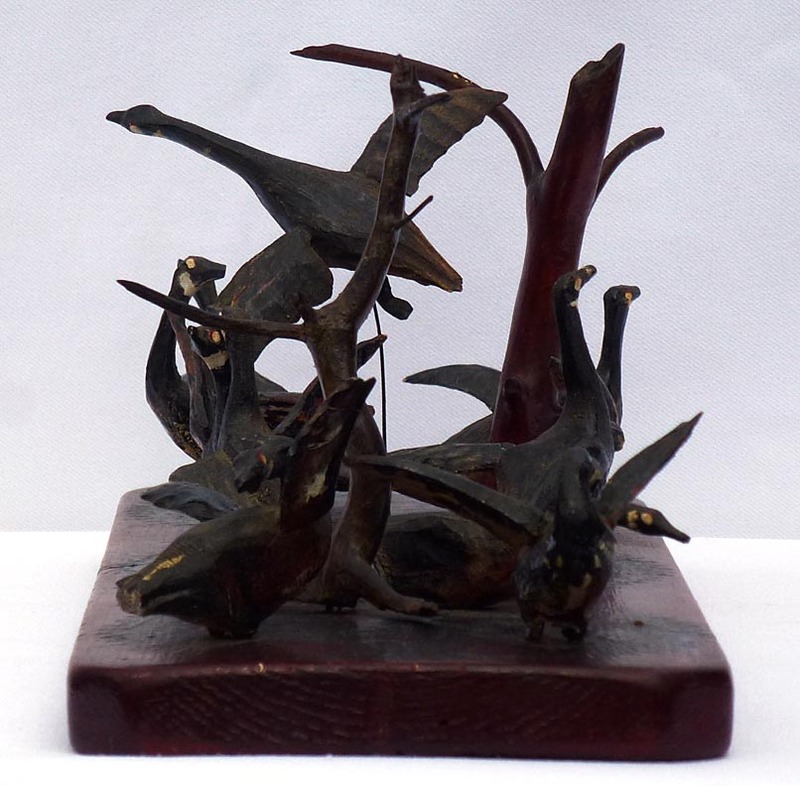 It is in extremely good condition, inscribed and dated 1947. Please visit the feature sale for full details and more photos. 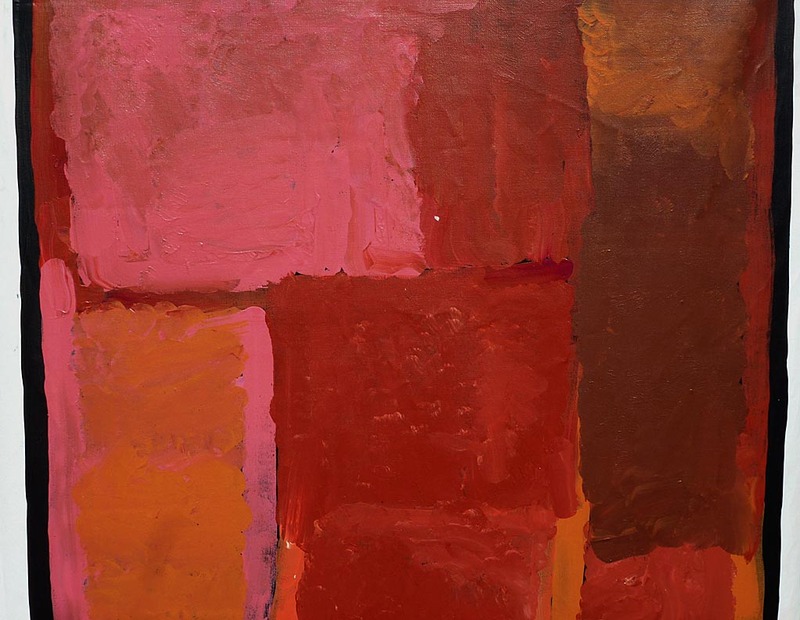 This is a large abstract painting in bold colors by Australian Aboriginal artist Kudditji Kngwarreye. 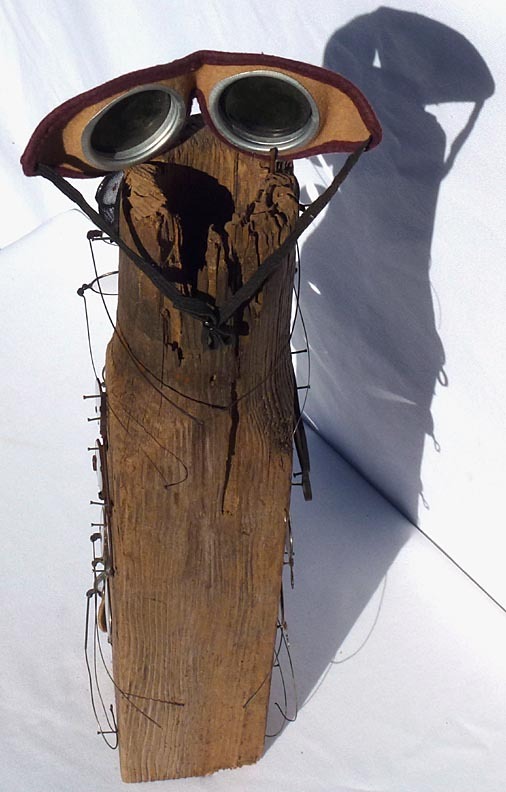 The artist is well known in Australia and participated in a number of international exhibitions. 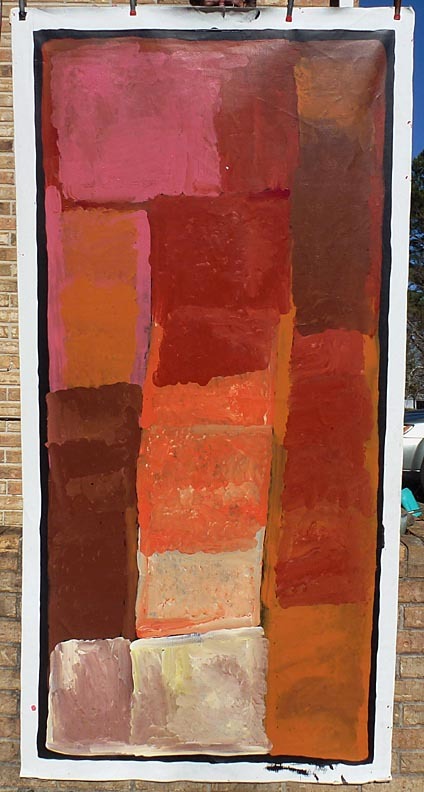 He began painting in 1986, and retired in early 2015. 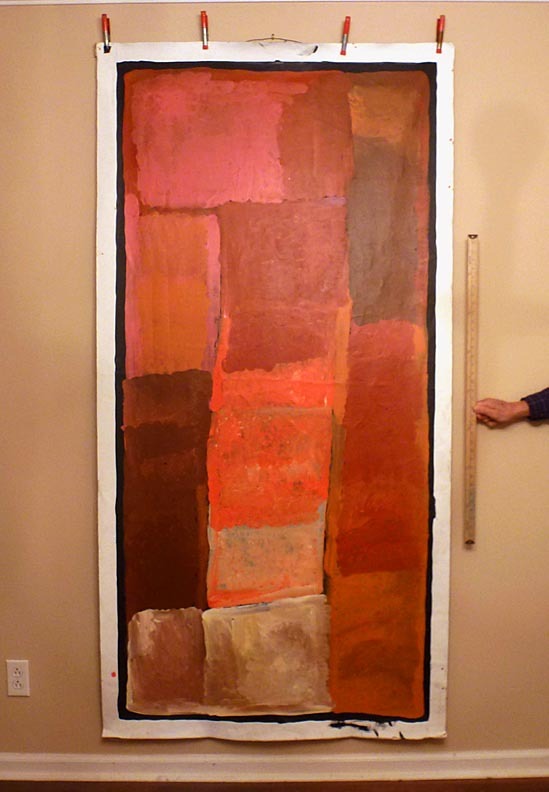 It measures 42" by 82", painted in acrylic on unstretched linen, and signed on the back. 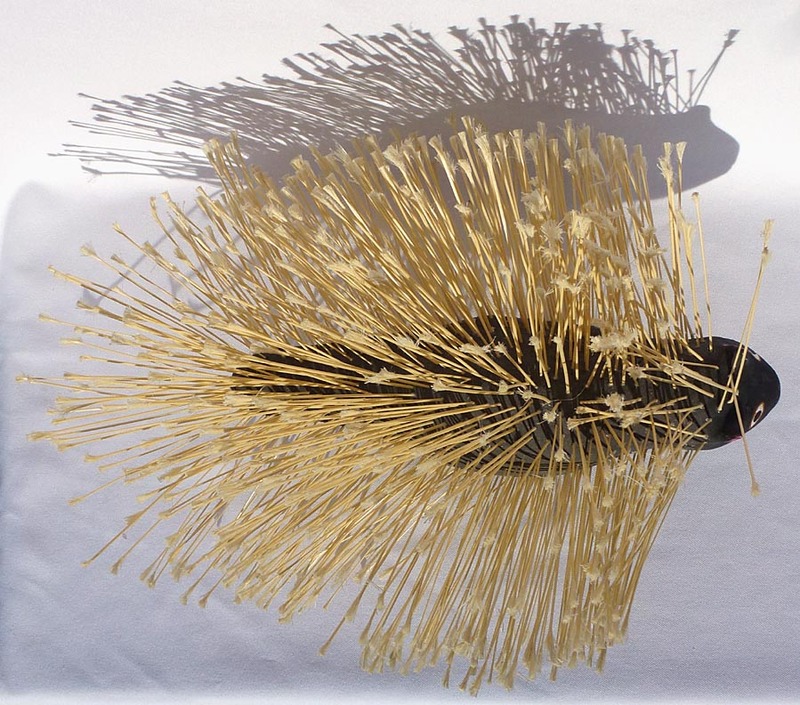 It will be shipped rolled, unmounted. The price is $4000.00. Inventory Code: CHSP. 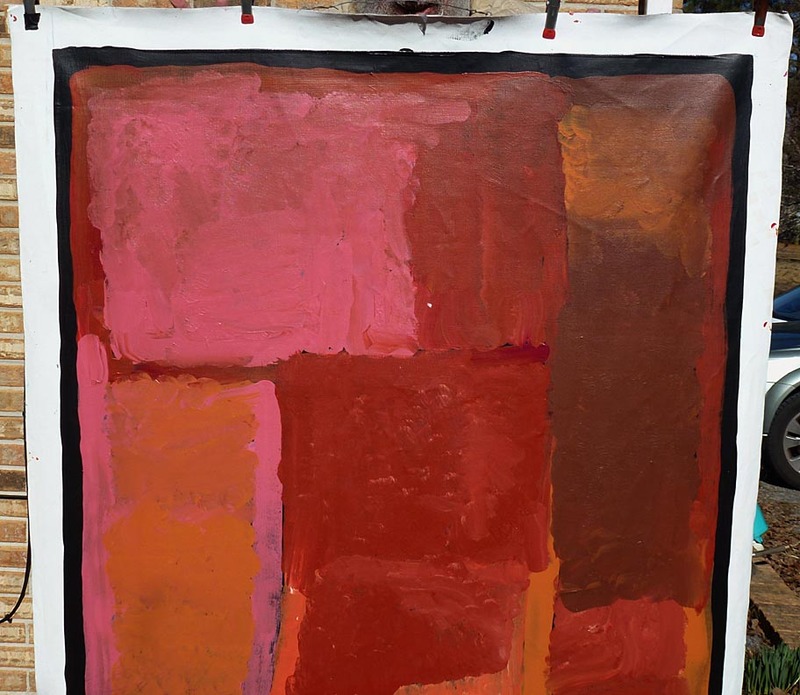 Aboriginal painting by Kudditji Kngwarreye ... Closeup of top ... Closeup of middle ... Closeup of bottom ... Closer view ... Back view ... Signature on back ... With a yardstick for scale ... Information sheet about the artist: large file (1.1Mb). 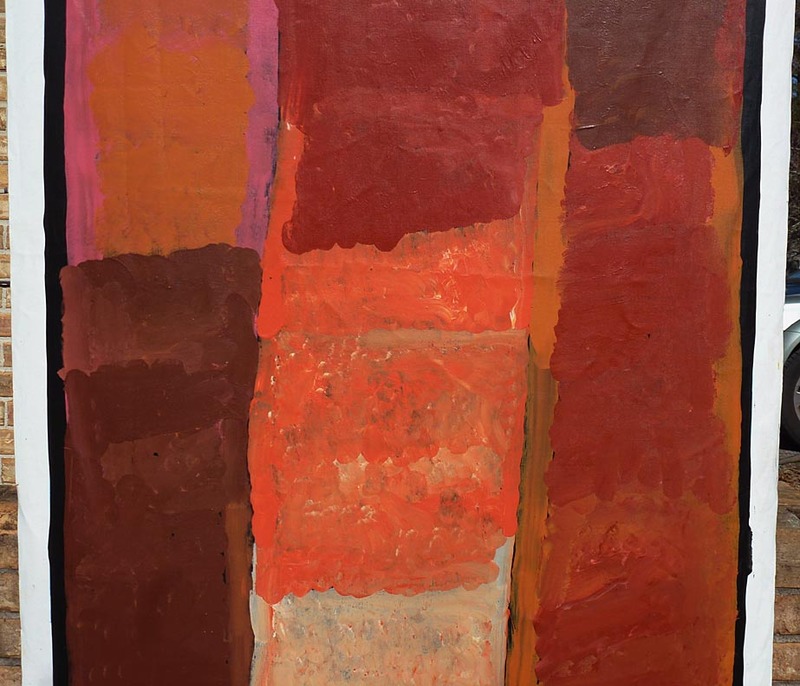 Some much larger photos: Aboriginal painting by Kudditji Kngwarreye ... Closeup of top ... Closeup of middle ... Closeup of bottom ... Closer view ... Back view ... Signature on back ... With a yardstick for scale ... Information sheet about the artist: large file (1.1Mb). 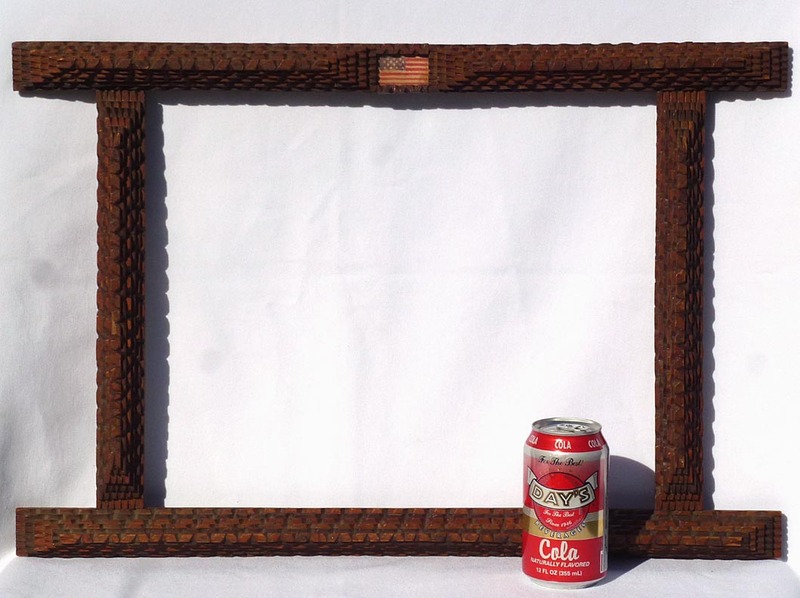 This is a tramp art frame with a small U.S. flag set into the top. It is built up in six chip-carved layers with nice detail at the ends of each layer. The flag appears to be hand colored fabric or ribbon and is set under a plastic window. 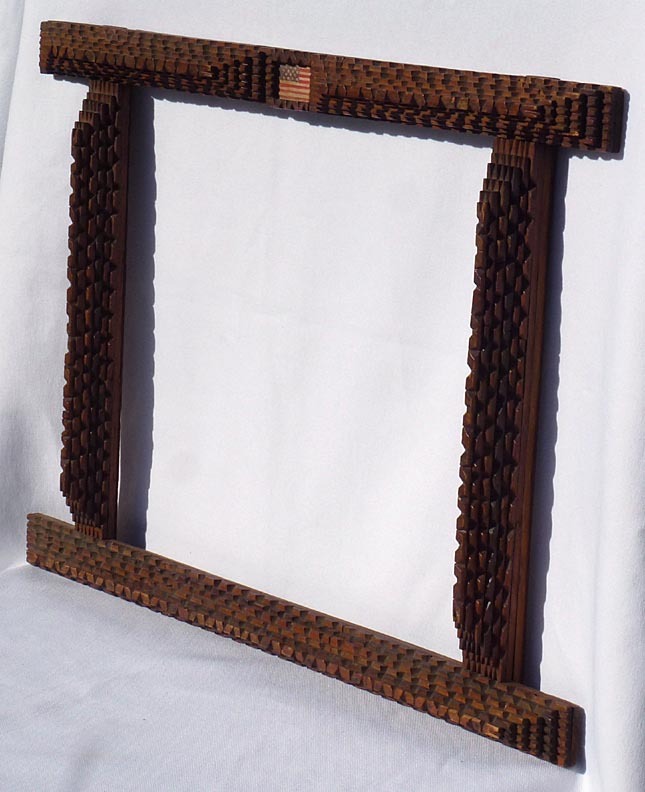 The frame measures 24" wide by 16" high by 2" deep. Age appears to be from the first quarter of the 1900's. 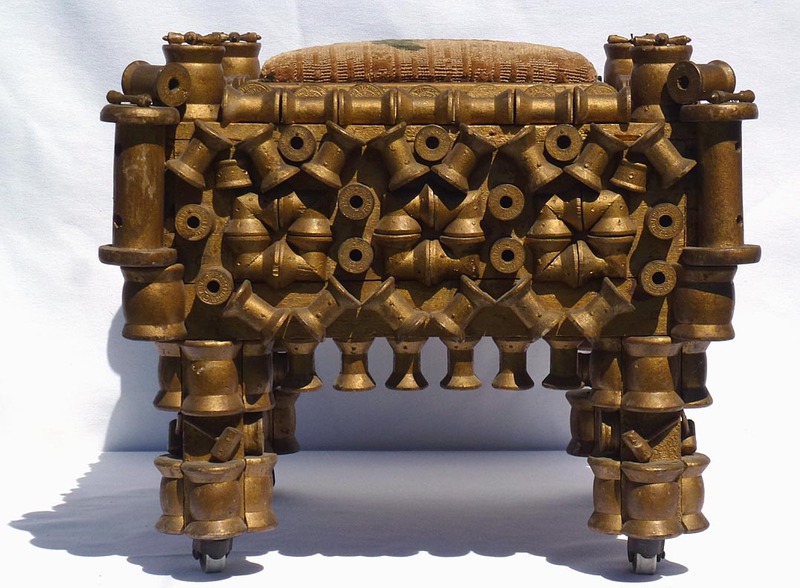 It is in excellent condition with one small chip missing on the left-hand side. The price is $275.00. Inventory Code: CHHP. 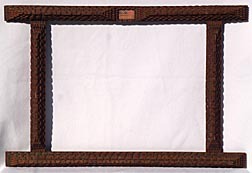 Tramp art frame with flag ... Side view ... The other side ... Two closeups of the flag ... From above ... Back view ... With a soda can for scale. Some much larger photos: Tramp art frame with flag ... Side view ... The other side ... Two closeups of the flag ... From above ... Back view ... With a soda can for scale. 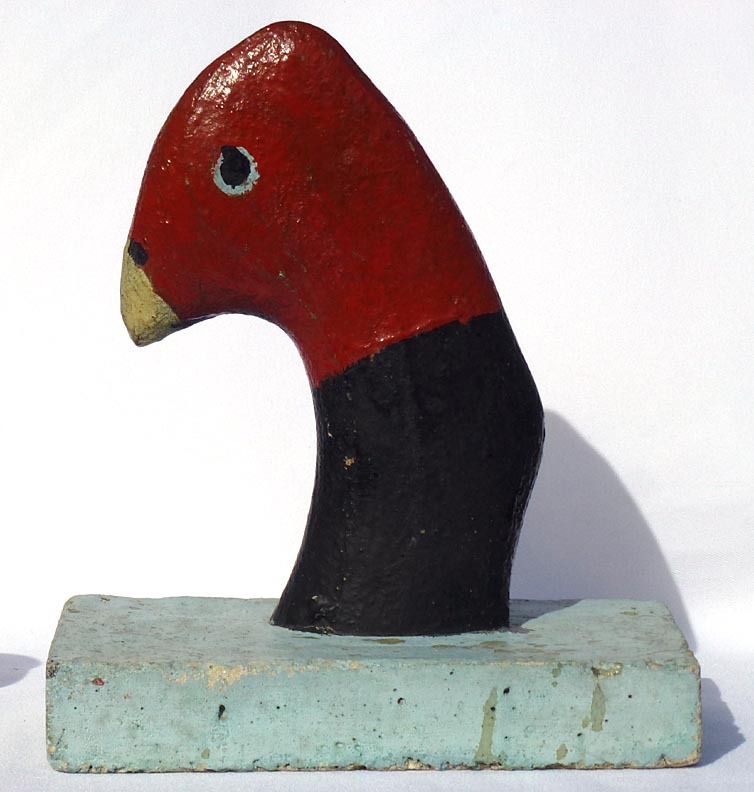 This is an odd folk art concrete bird. It is hand made. 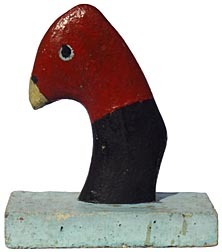 The piece is painted black and reddish brown, with yellowish beak and pale blue on the base. 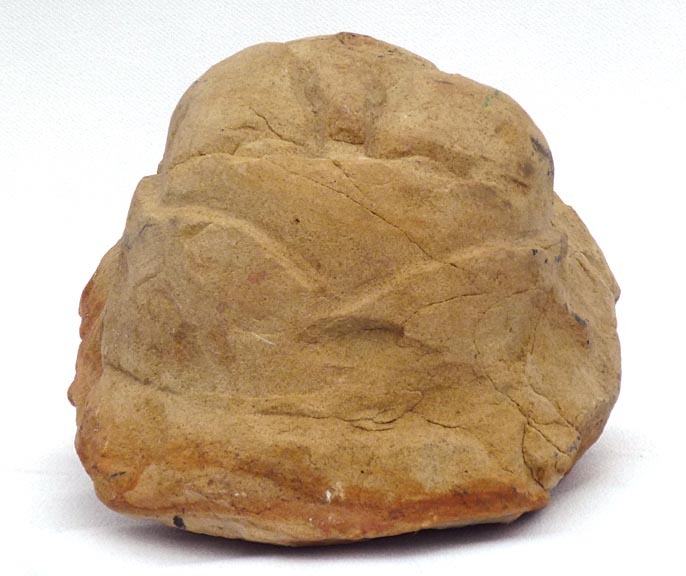 There is some paint loss to the head and a little wear to the base, with a very slight surface crack. Otherwise it is in good condition with slight chips. 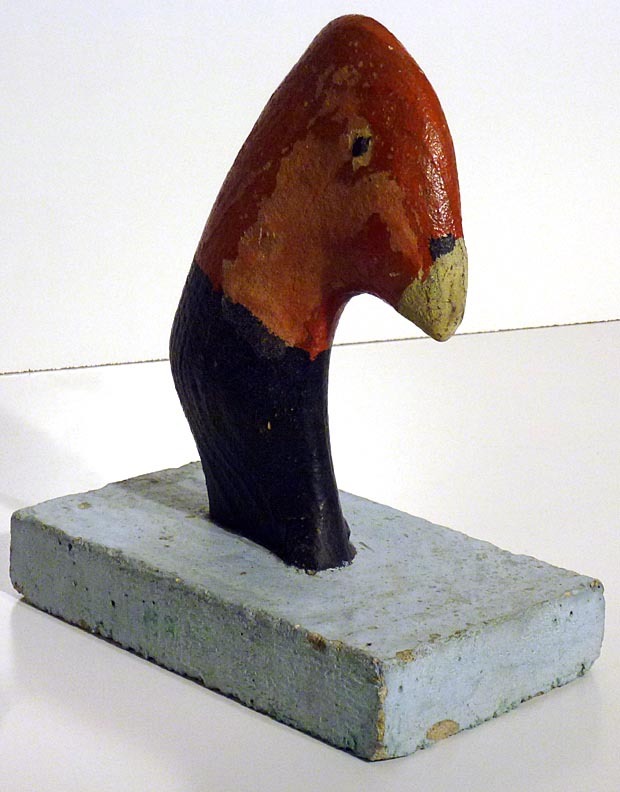 The age is unknown, although it likely was made around the 1970's or 80's, but could be more recent. 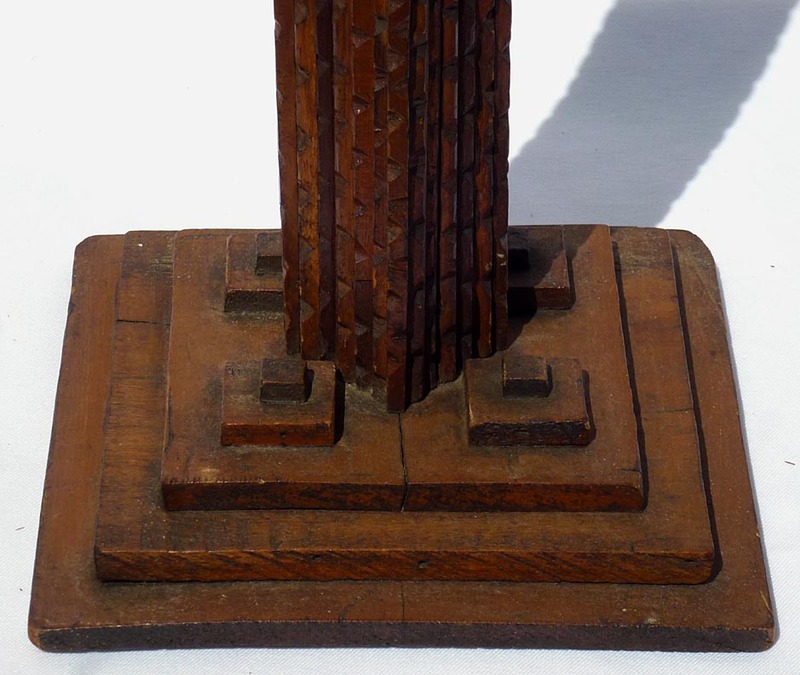 The base is 9 1/4" by 5", and the overall height is about 10 3/4". The price is $150.00. Inventory Code: CHOO. 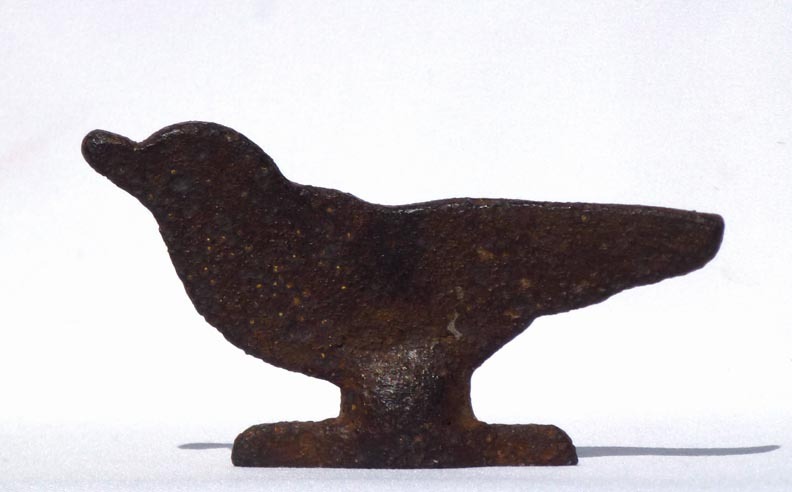 Concrete bird ... The other side ... Another angle ... Front view ... Back view ... From above ... From below ... With a soda can for scale. 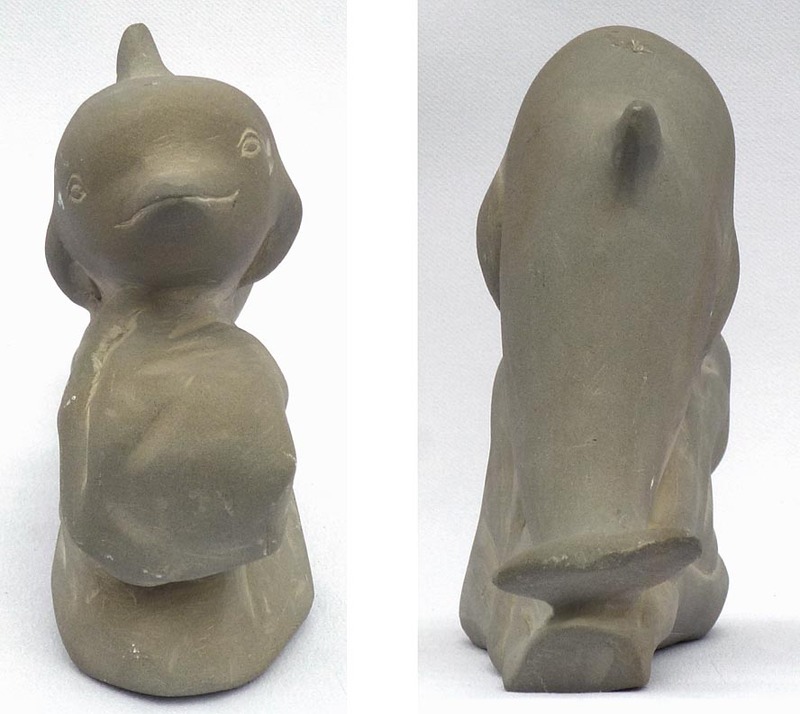 Some much larger photos: Concrete bird ... The other side ... Another angle ... Front view ... Back view ... From above ... From below ... With a soda can for scale. 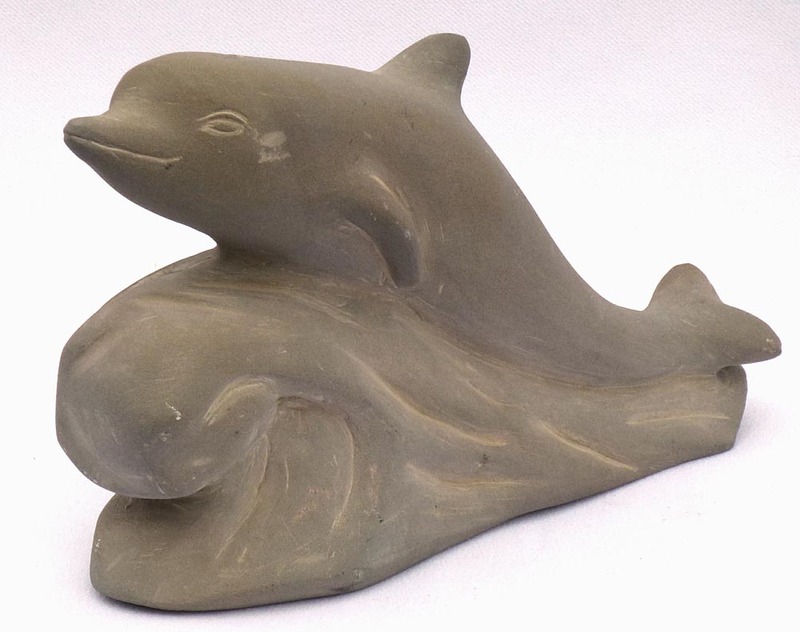 This is a stone carving of a dolphin riding a wave. 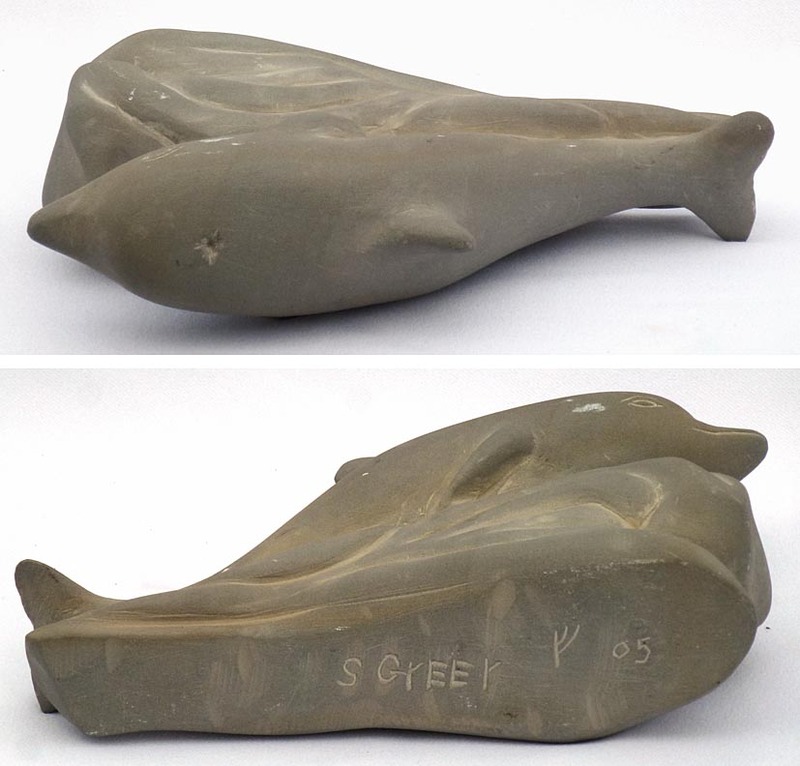 It was made by Stanley Greer, who studied under Popeye Reed, and is signed and dated on the bottom "S Greer 05". 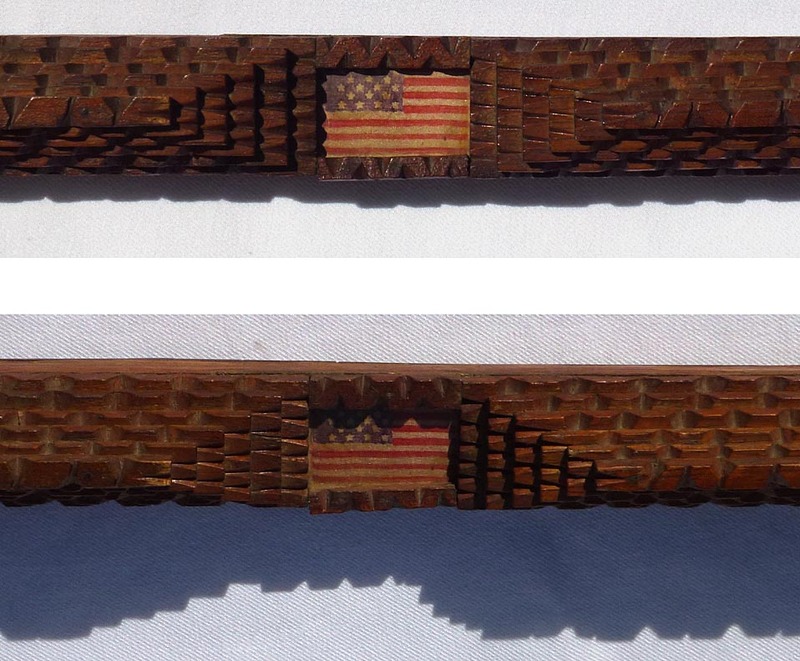 It measures about 8 1/2" long by 5 3/4" high by 2 1/2" wide and is in excellent condition. The price is $250.00. Inventory Code: CHRT. 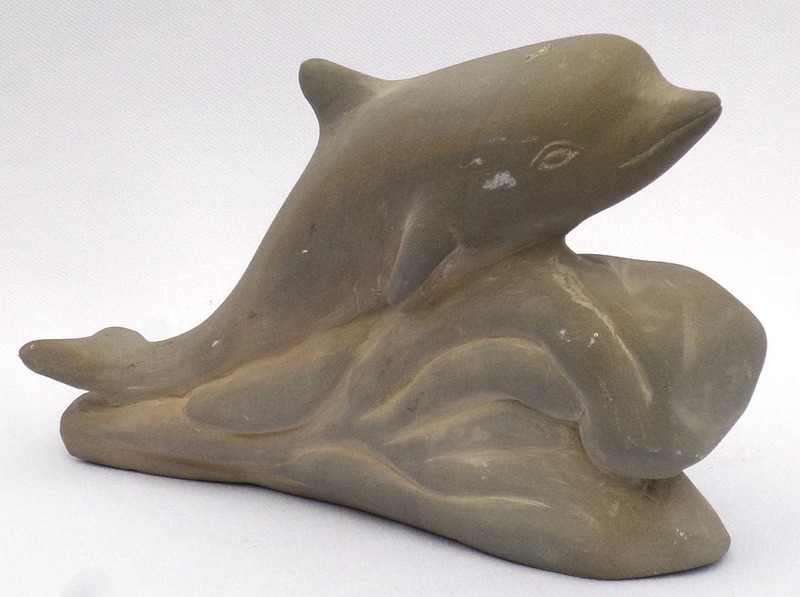 Carved stone dophin by Stanley Greer ... The other side ... Another angle ... Fourth view ... Front and back views ... From above and below ... With a soda can for scale. 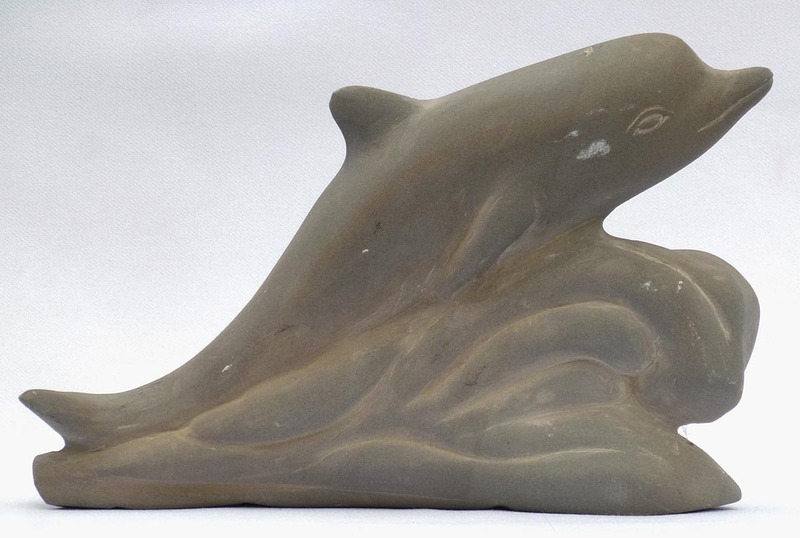 Some much larger photos: Carved stone dophin by Stanley Greer ... The other side ... Another angle ... Fourth view ... Front and back views ... From above and below ... With a soda can for scale. 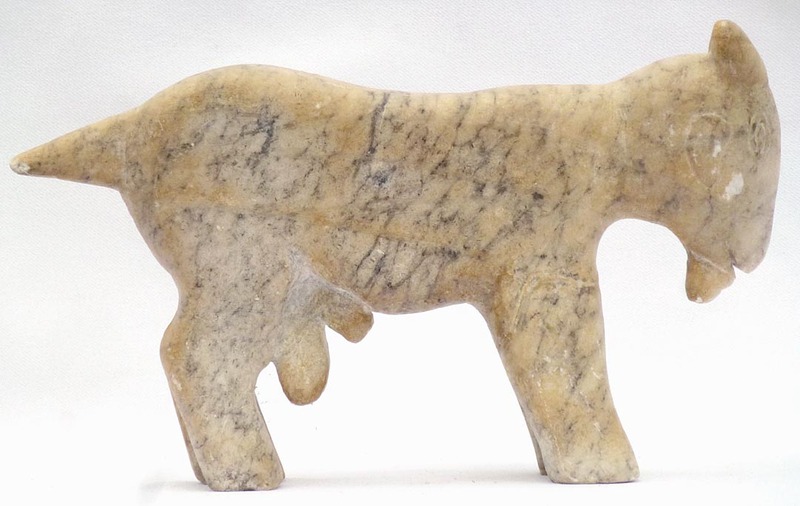 This is a goat carved from a dense, heavy stone, either granite or marble. 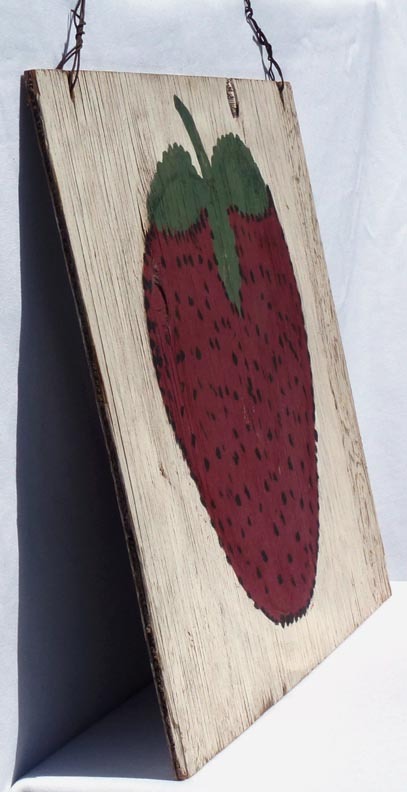 It measures 10 1/2" long by 6 1/2" high by 2 1/4" wide. 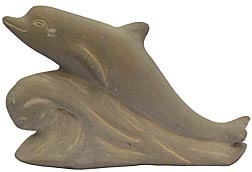 The condition is very good, possibly missing a small chip off the end of the tail. 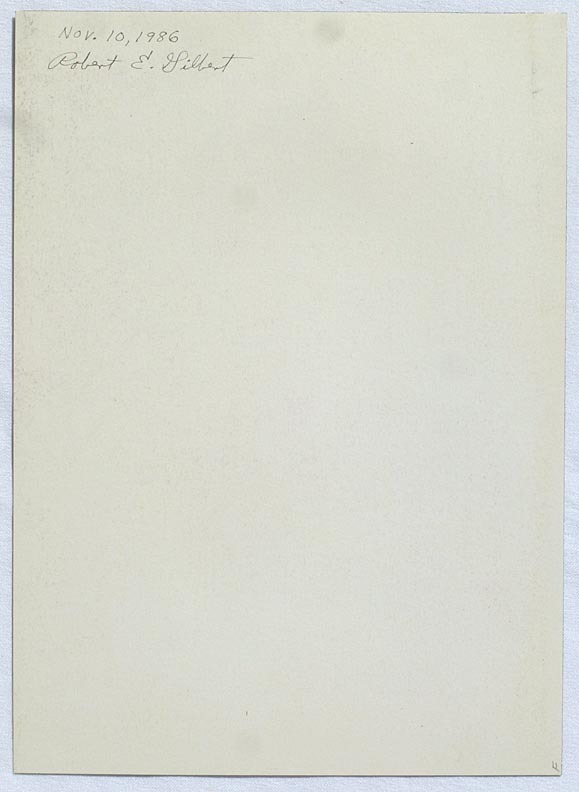 There is no signature, and the age is unknown. The price is $250.00. Inventory Code: CHRC. 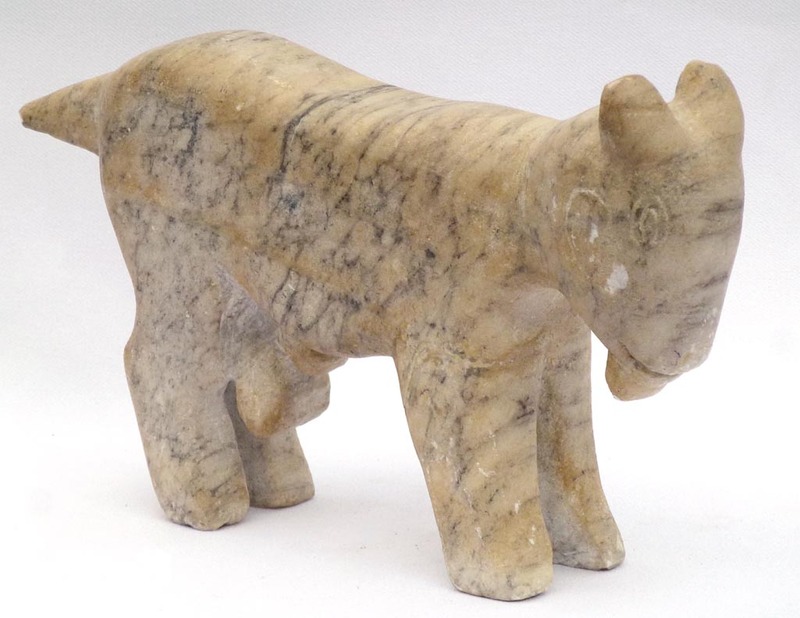 Carved stone goat ... Another angle ... Side view ... Front and back views ... From above and below ... The other side, with a soda can for scale. 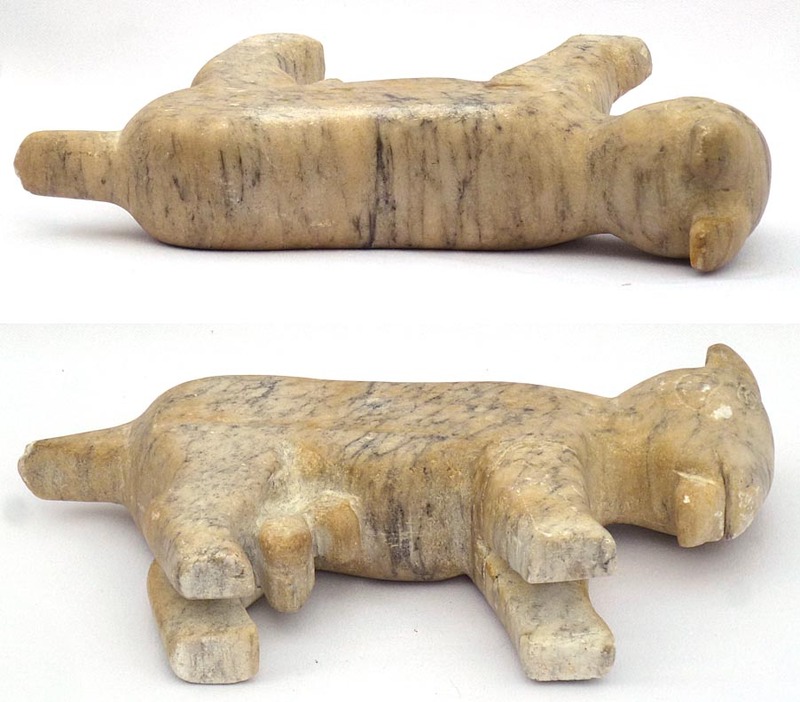 Some much larger photos: Carved stone goat ... Another angle ... Side view ... Front and back views ... From above and below ... The other side, with a soda can for scale. 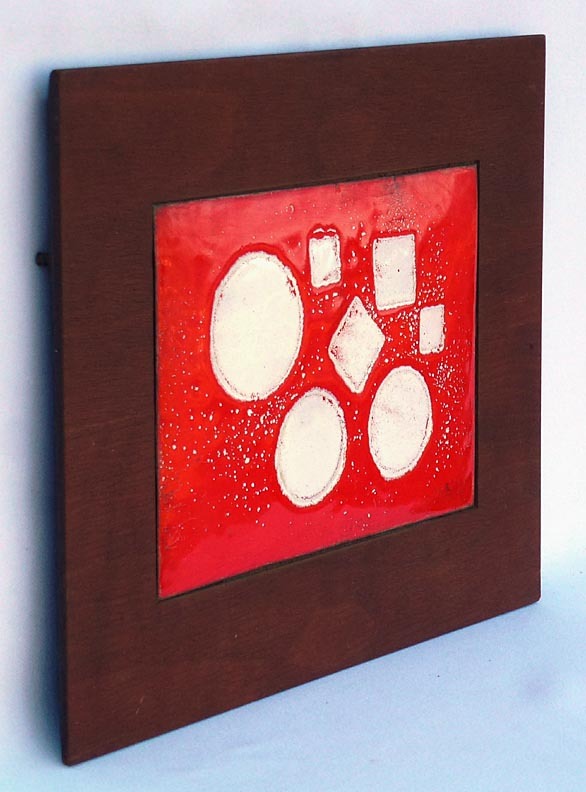 This is a colorful Mid-Century modern style enameled plaque set in a frame cut from a single piece of wood. It has geometric squares and circles of white on a red background highlighted with spatterings of white throughout. There may be a signature in the corner, we are not sure. The plaque itself is about 5 1/2" by 8", and the frame is just under 9 1/2" by 12" by 1/2" thick. 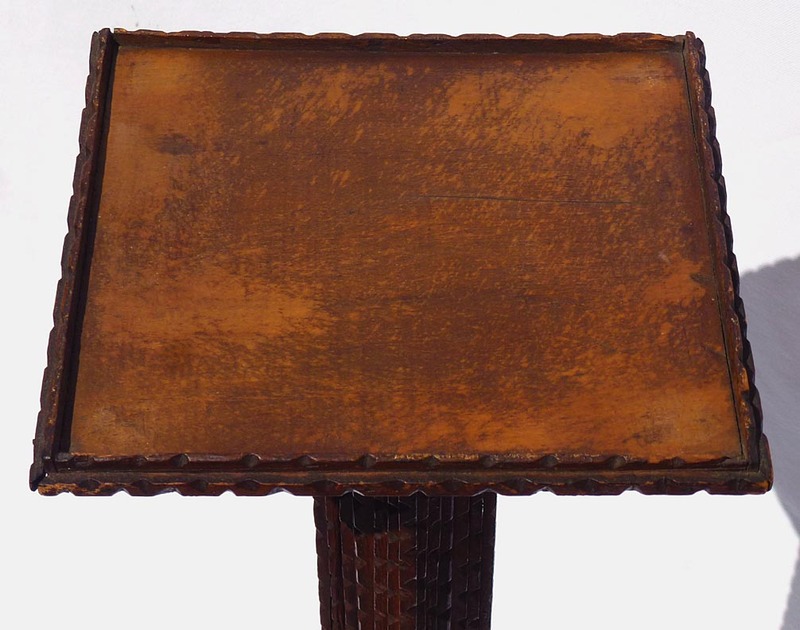 Overall it is in very good condition with some slight crazing to the enamel work. 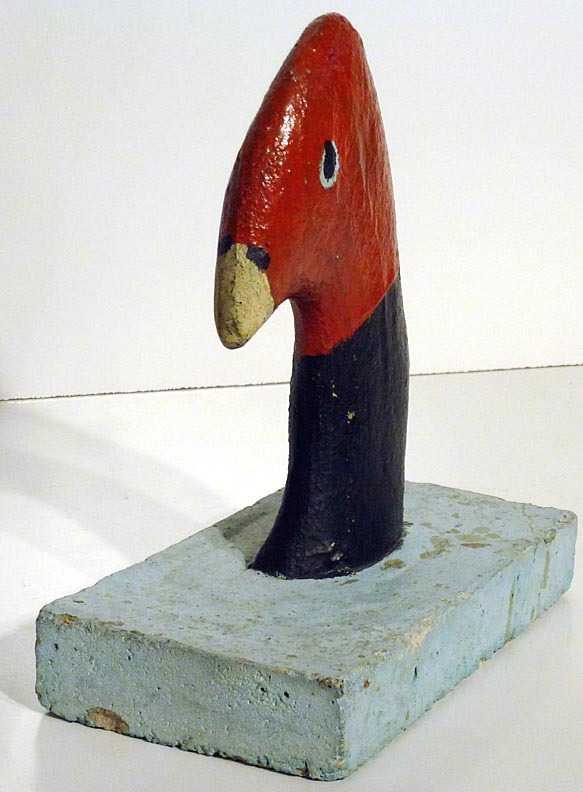 It was probably made around the 1950's or 60's. The price is $175.00. Inventory Code: CWSO. 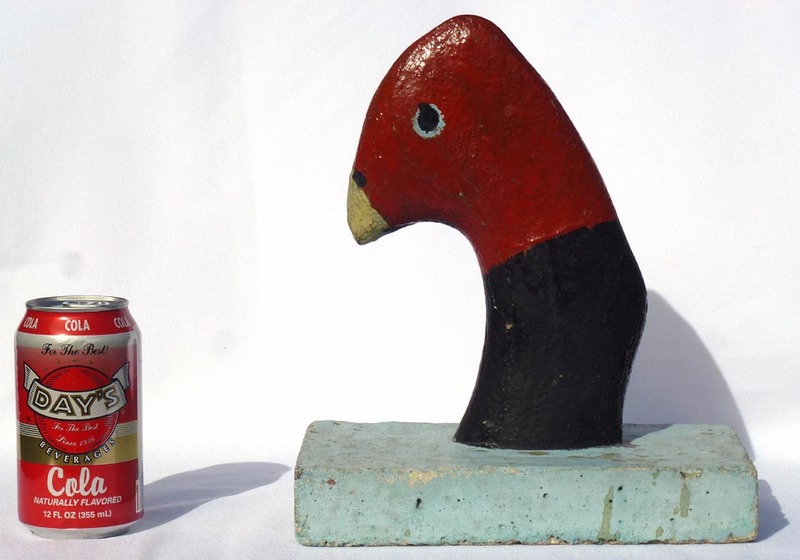 Mid-century modern enameled plaque ... Side view ... Back view ... With a soda can for scale. 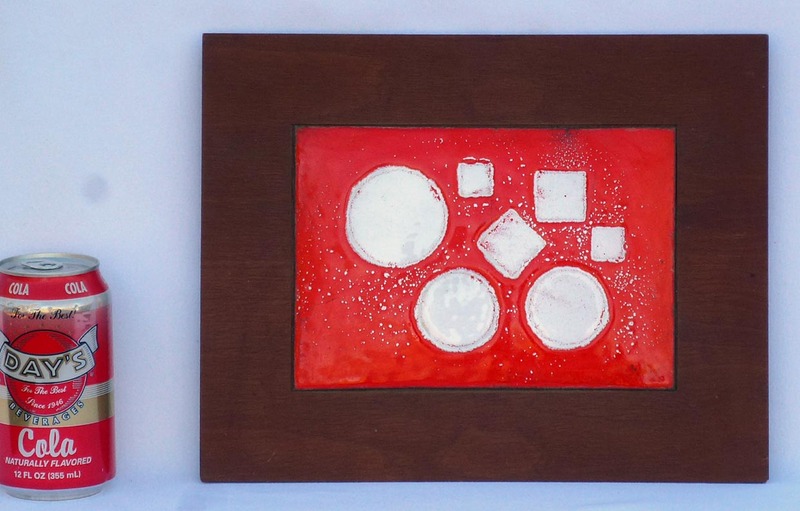 Some much larger photos: Mid-century modern enameled plaque ... Side view ... Back view ... With a soda can for scale. 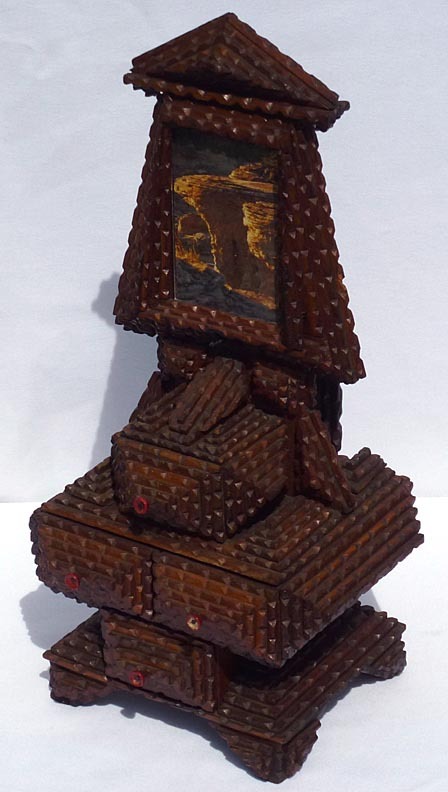 Next are three outer space/fantasy artworks by Robert E. Gilbert. 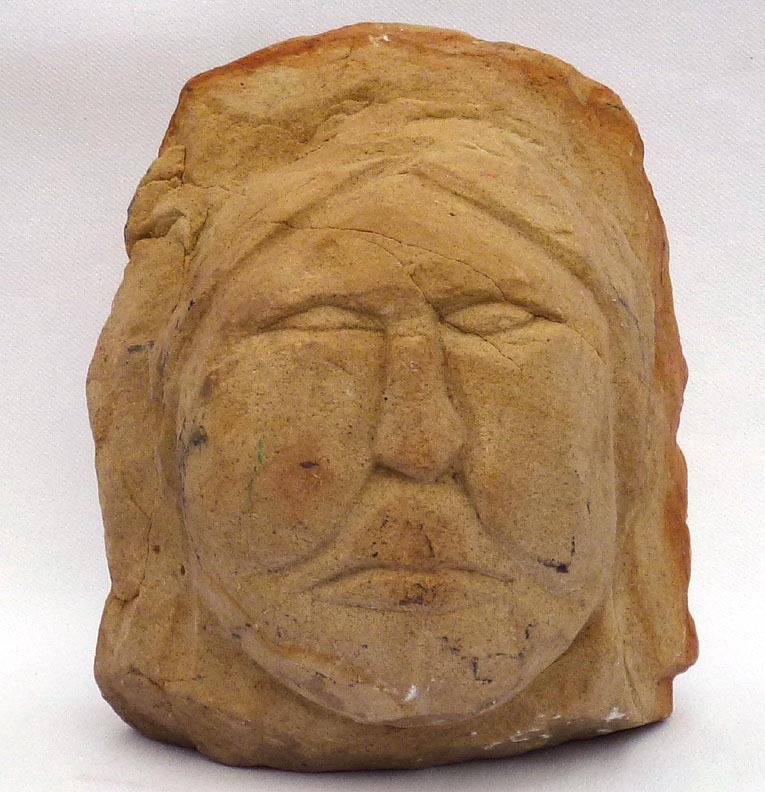 REG was a Tennessee artist who worked mainly from the 1940's through the 80's, experimenting with traditional and non-traditional styles. 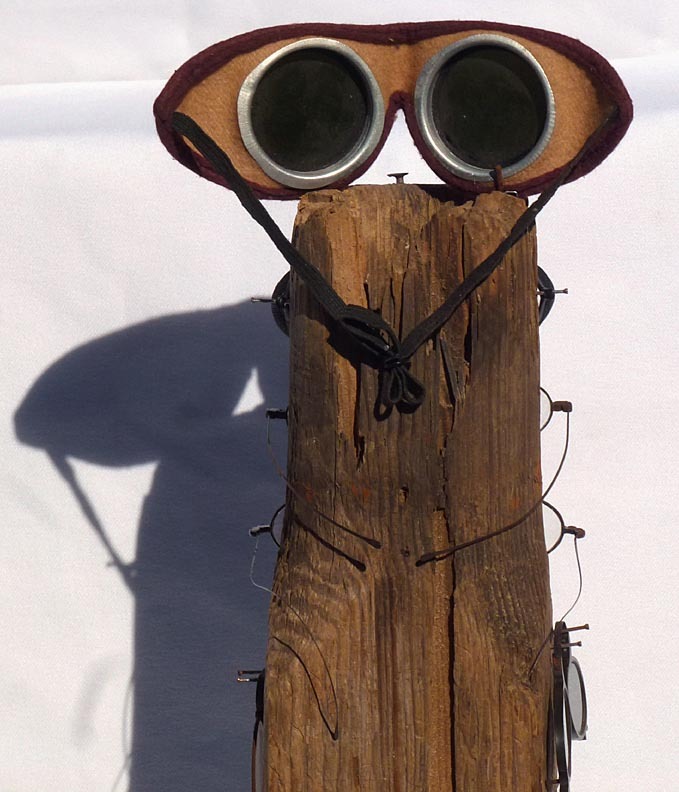 You can read more about him and see much more of his art here. 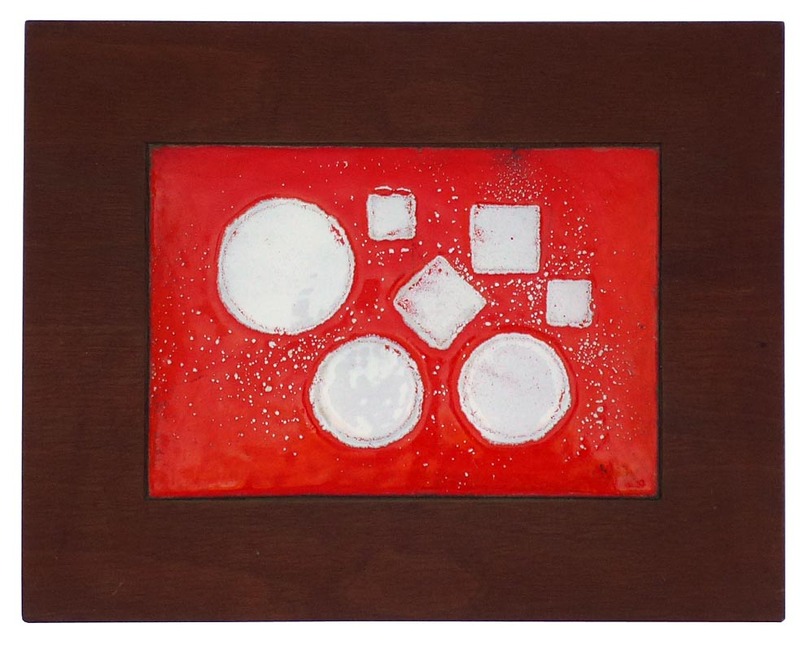 Each of these is mounted in a green wooden frame, 19 1/4" by 15 1/4" with no glass. They are held in place with small clear plastic corners that are adhered to the backing, not to the artwork, and can easily be removed. 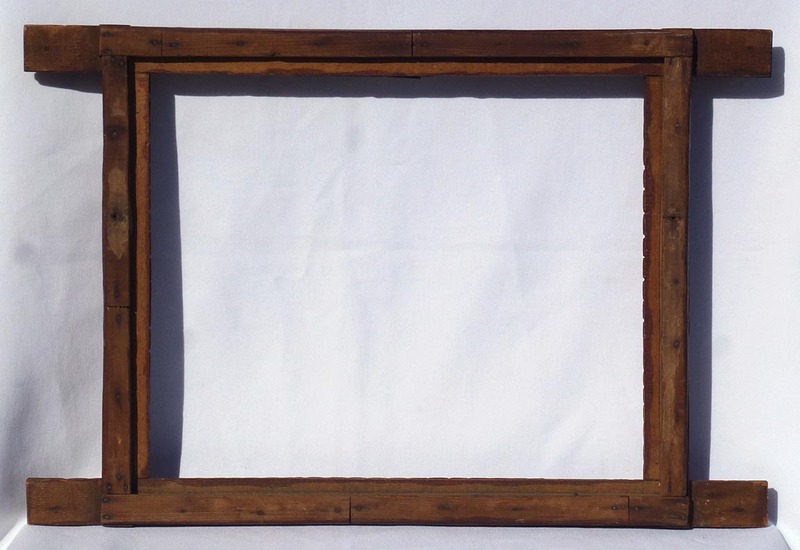 If you wish glass for the frame you should be able to get it cut and installed locally very inexpensively. If you don't want the frame, they are available without it. 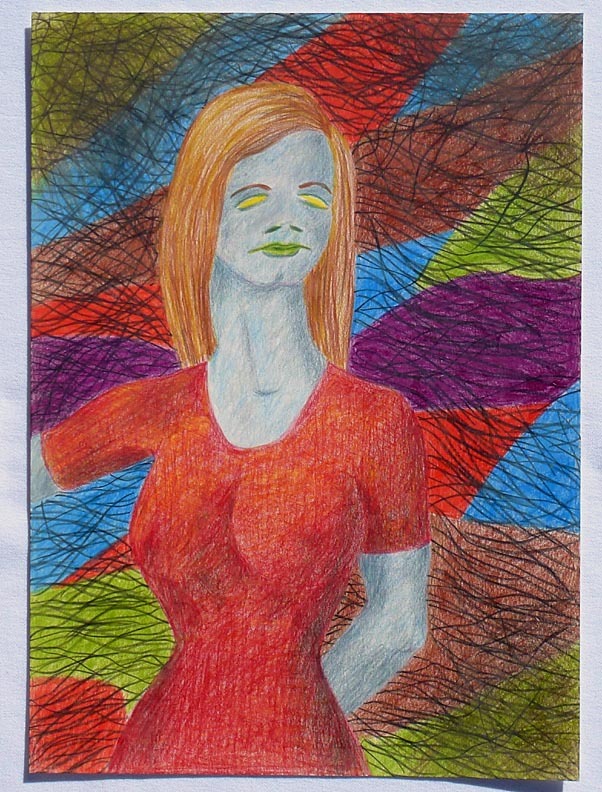 Drawing of a blue skinned woman in a red dress, with an obsessively detailed background. 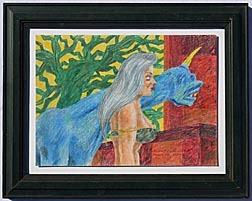 It is crayon on lightweight poster board, signed and dated on the back "Robert E. Gilbert Nov. 10, 1986". 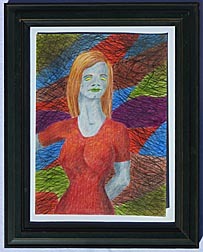 It is in a green wooden frame, 19 1/4" by 15 1/4" with no glass. (See notes on the frame above.) The price is $325.00. Inventory Code: REG 113. Drawing by Robert E. Gilbert ... In the frame ... Back ... With a 12" ruler for scale. 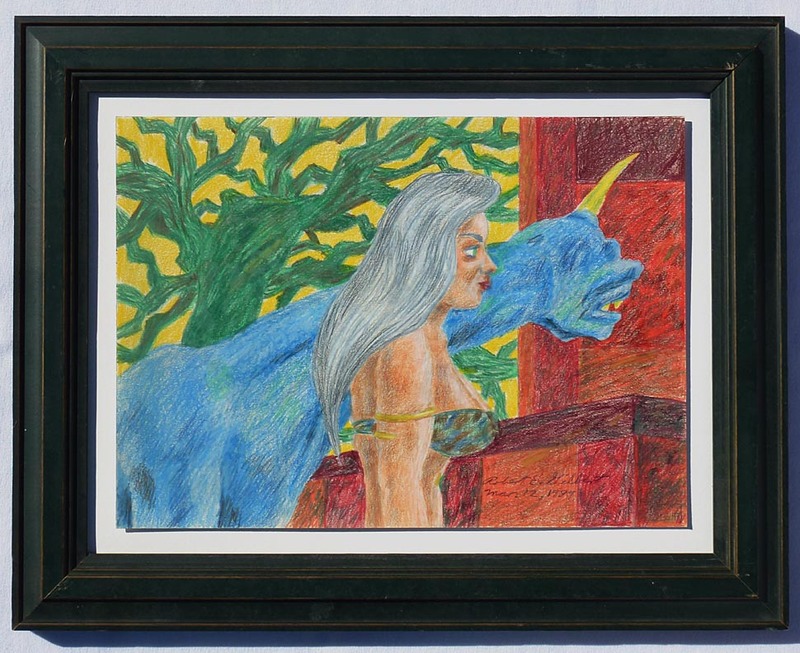 Some much larger photos: Drawing by Robert E. Gilbert ... In the frame ... Back ... With a 12" ruler for scale. 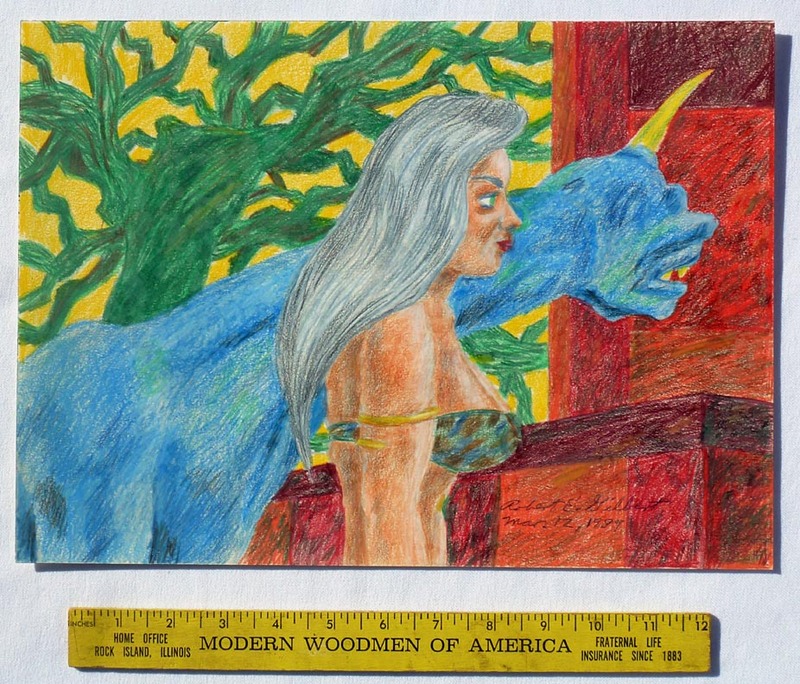 Drawing of a woman with an alien animal in a green wooden frame, 19 1/4" by 15 1/4" with no glass. (See notes on the frame above.) 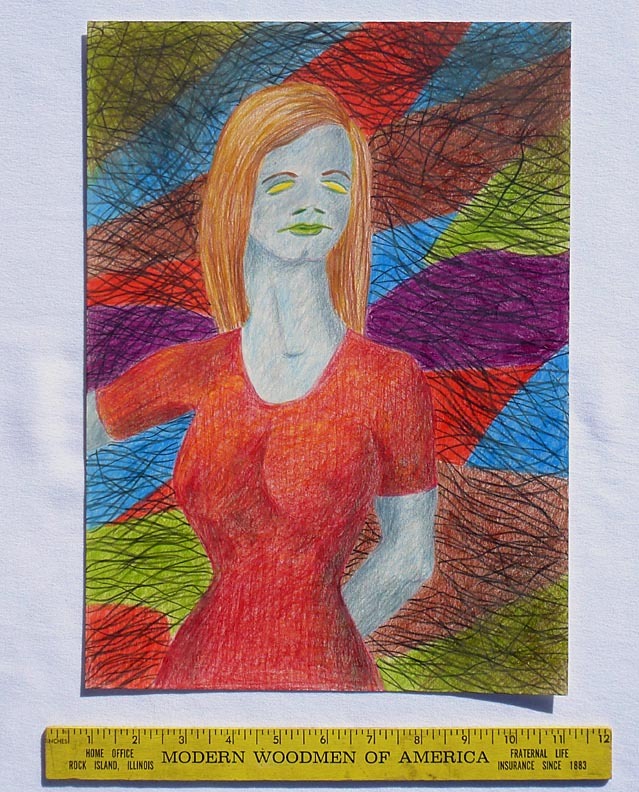 It is crayon on lightweight poster board, signed "Robert E. Gilbert Mar. 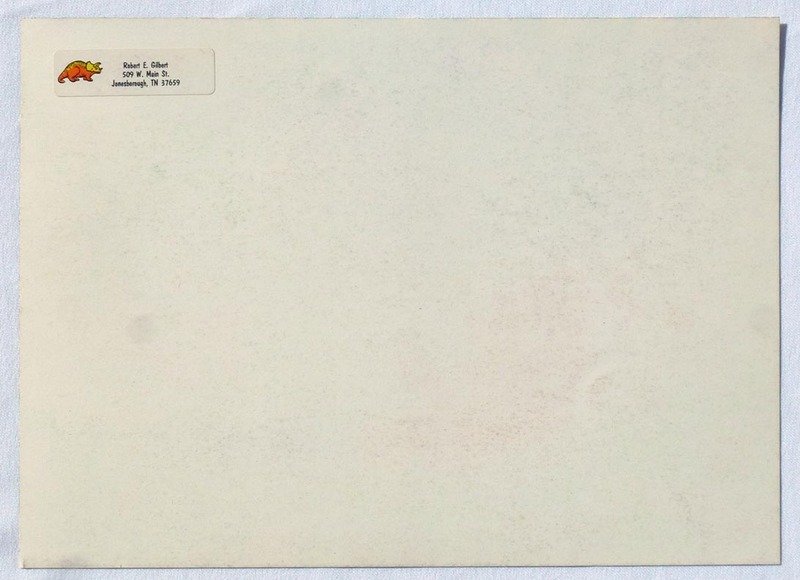 12, 1989", and has an address label on the back. The price is $325.00. Inventory Code: REG 114. 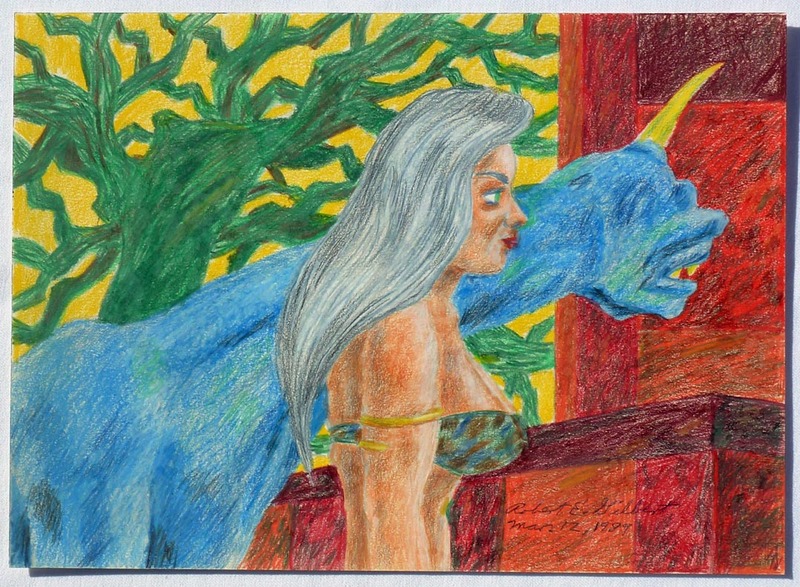 Drawing of woman and alien by Robert E. Gilbert ... In the frame ... Back ... With a 12" ruler for scale. 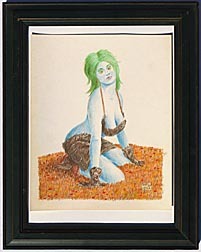 Some much larger photos: Drawing of woman and alien by Robert E. Gilbert ... In the frame ... Back ... With a 12" ruler for scale. 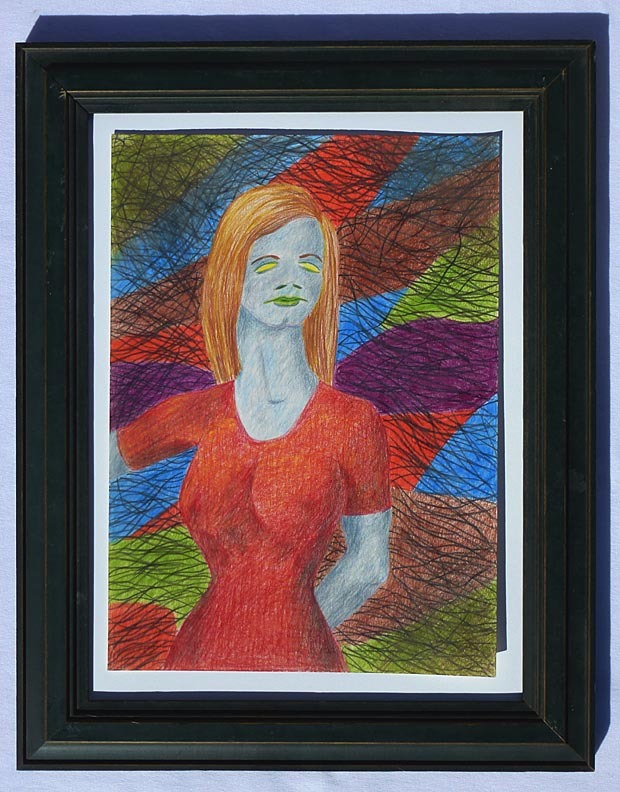 Drawing of a woman in a green wooden frame, 19 1/4" by 15 1/4" with no glass. (See notes on the frame above.) 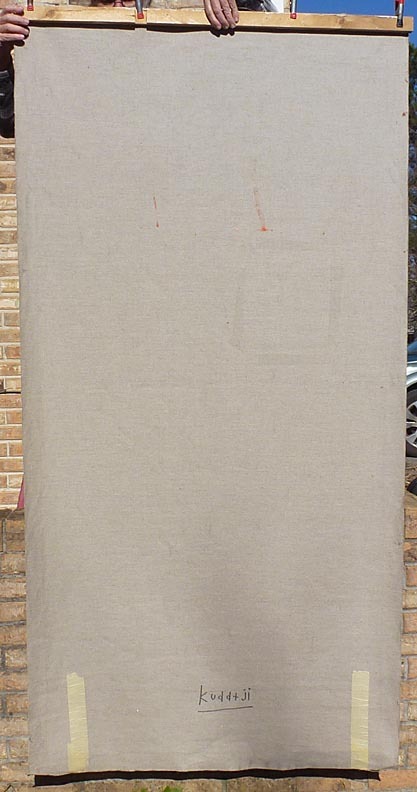 It is crayon on lightweight poster board, initialled "REG 1982" on the front, and dated "Nov. 4, 1982" on the back. The price is $325.00. Inventory Code: REG 112. 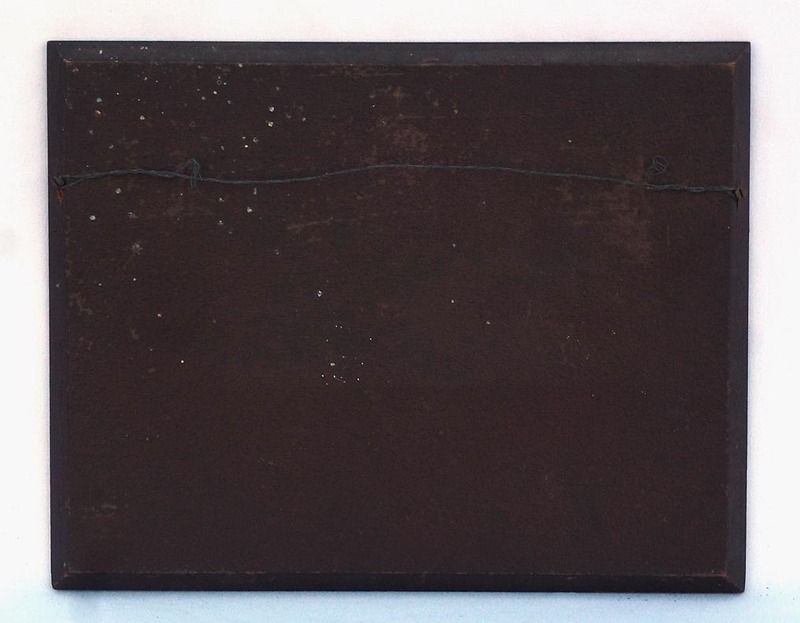 Drawing by Robert E. Gilbert ... Back ... With a 12" ruler for scale. Some much larger photos: Drawing by Robert E. Gilbert ... Back ... With a 12" ruler for scale. 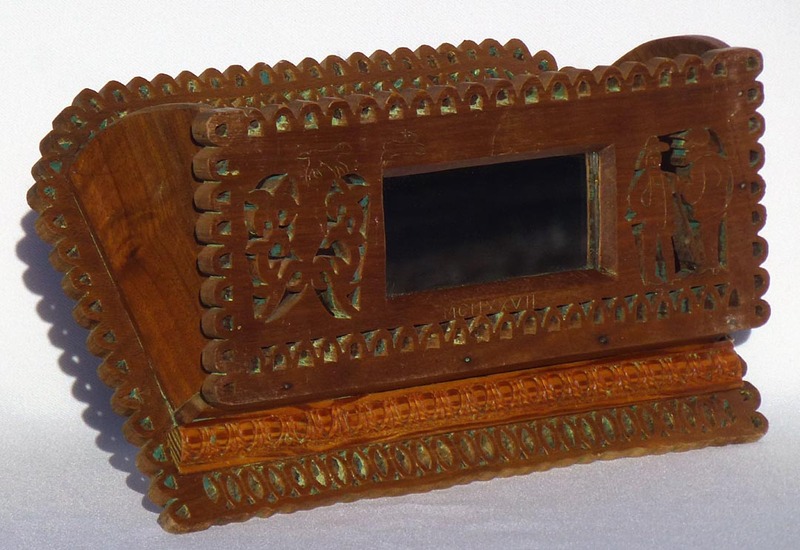 This is a hand cut fretwork wall box or comb case with carved decoration, dated 1927. 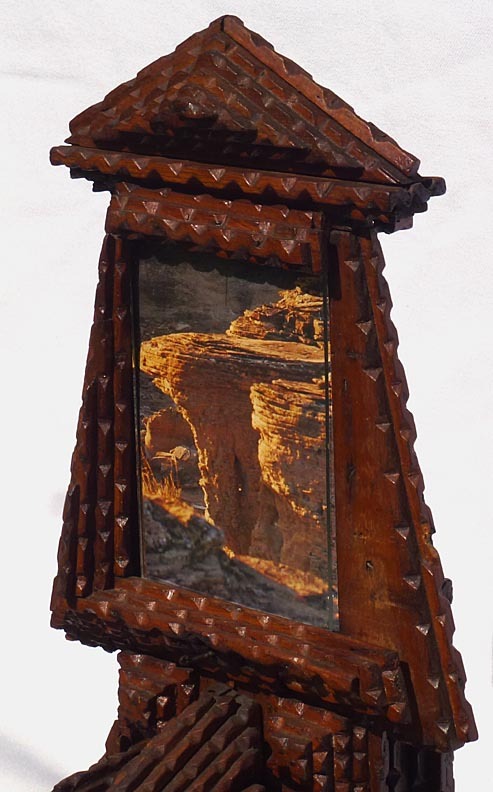 The front has two hunters on the right and a floral design on the left, with a mirror set in between the two. 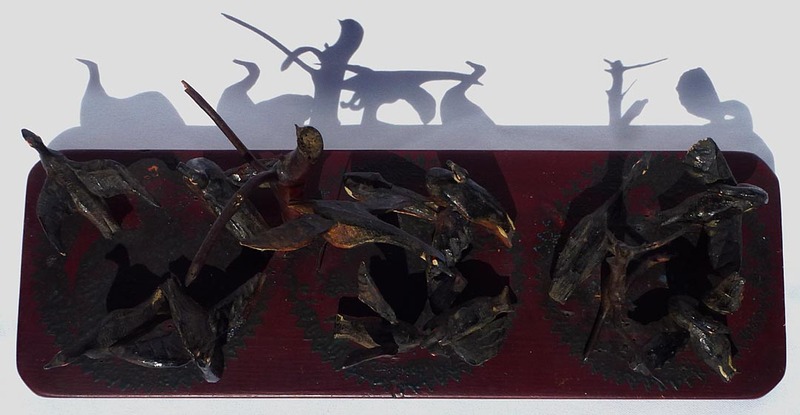 Above the floral design are faint incised carvings of a dog chasing a rabbit. 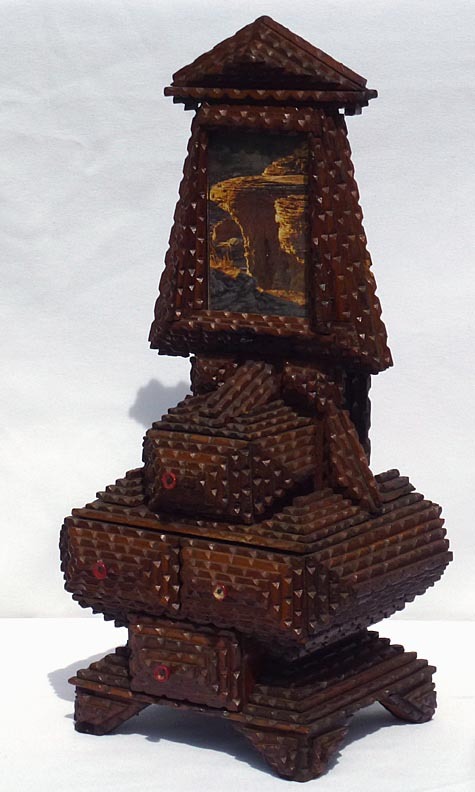 Under the mirror is carved "MCMXXVII". 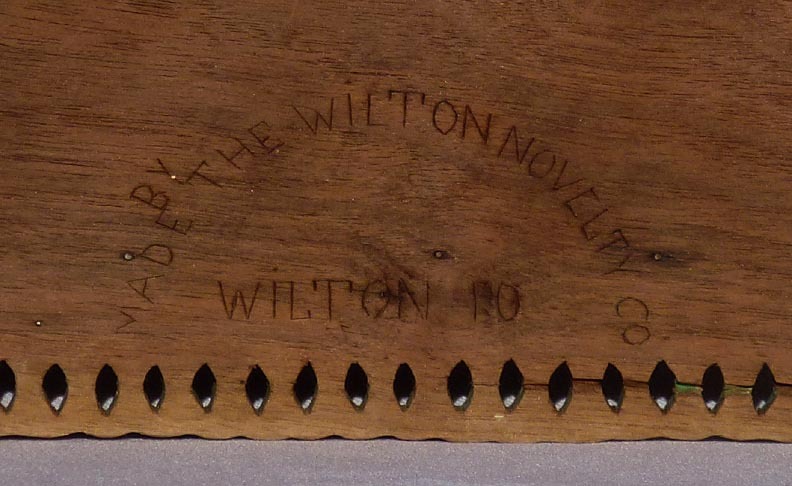 The back has a hand carved inscription "Made by the Wilton Novelty Co Wilton 10". 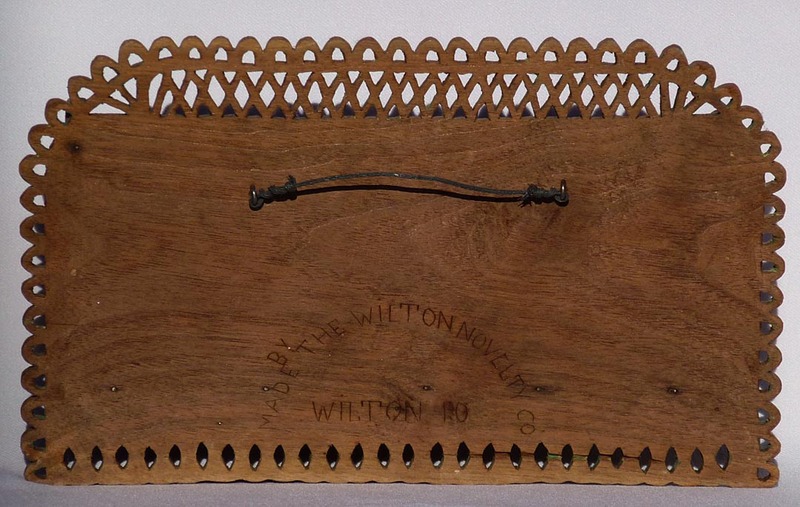 The wood is probably walnut, with a machine cut molding strip of different wood across the bottom. 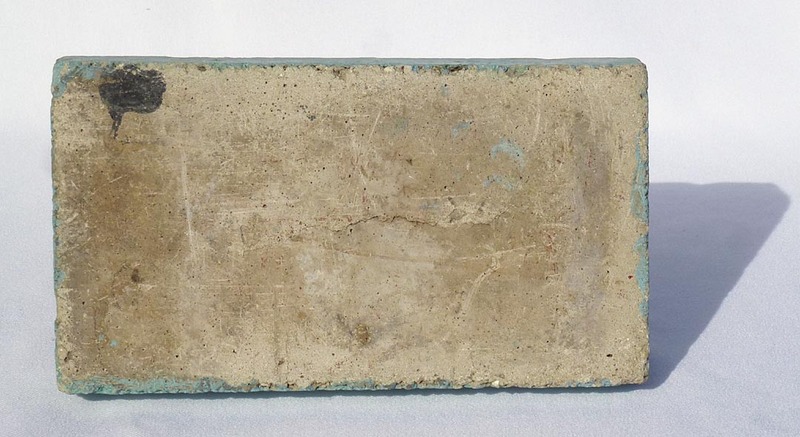 It has an unfinished surface, although there are faint traces of green paint in the crevices. The mirror appears to have been replaced. 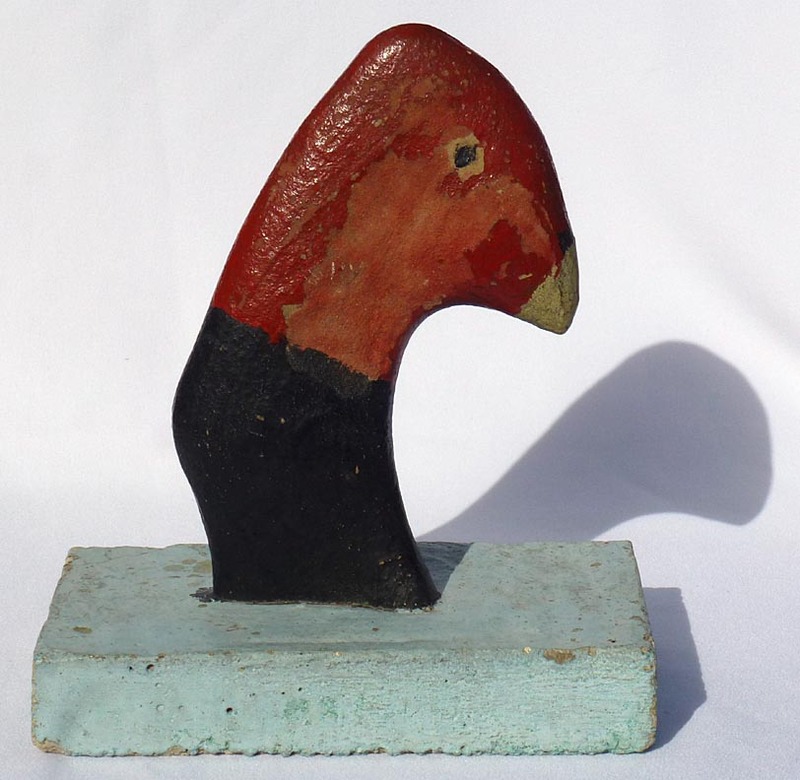 The size is 11 3/4" wide by 7" high by 3 3/4" deep, and the condition is excellent. The price is $175.00. Inventory Code: CHTR. 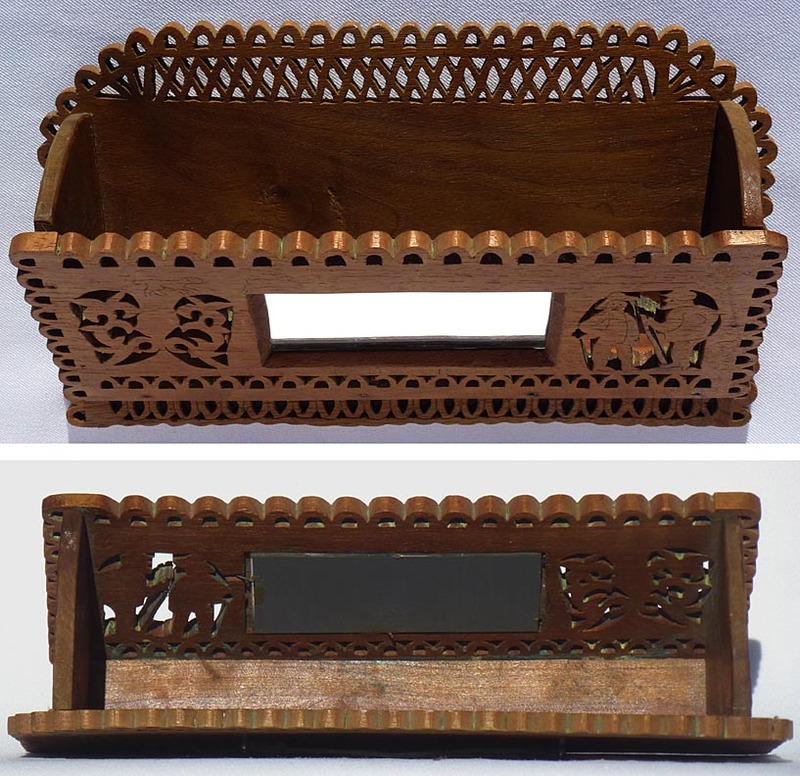 Carved fretwork comb case ... Another angle ... Two views from above ... Side views ... Back view ... Closeup of back ... With a soda can for scale. 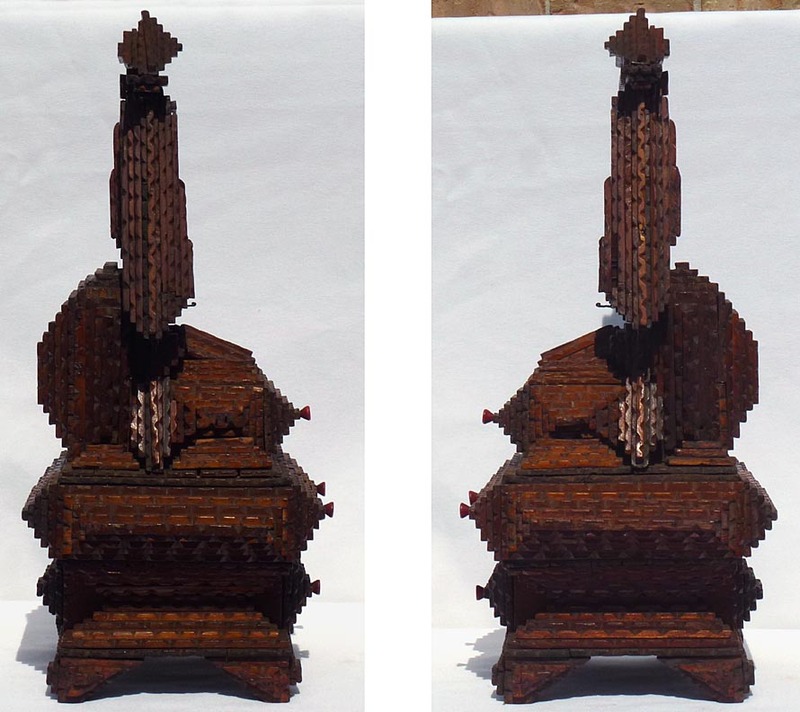 Some much larger photos: Carved fretwork comb case ... Another angle ... Two views from above ... Side views ... Back view ... Closeup of back ... With a soda can for scale. 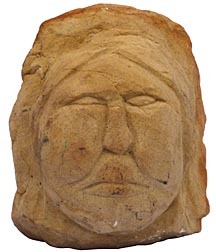 This is a strong, primitive face carved from sandstone. 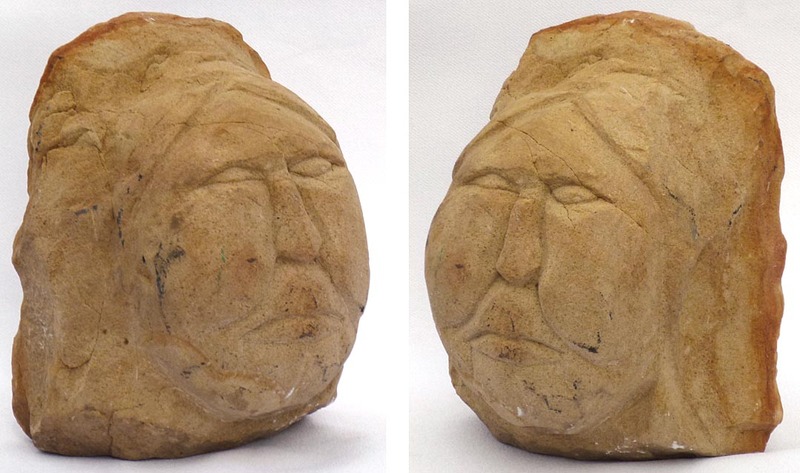 It is about 6 1/2" high by 5 1/2" wide by 4 1/2" deep. 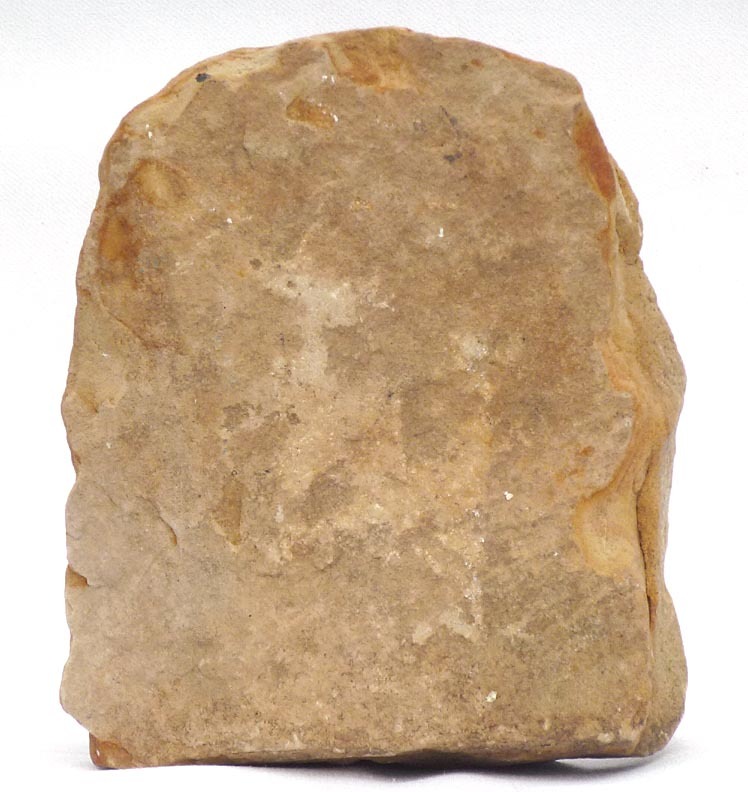 The stone has some fine natural cracks running through it, and some dark surface marks, but the carving is in very good condition. The age is unknown. The price is $175.00. Inventory Code: CHRA. 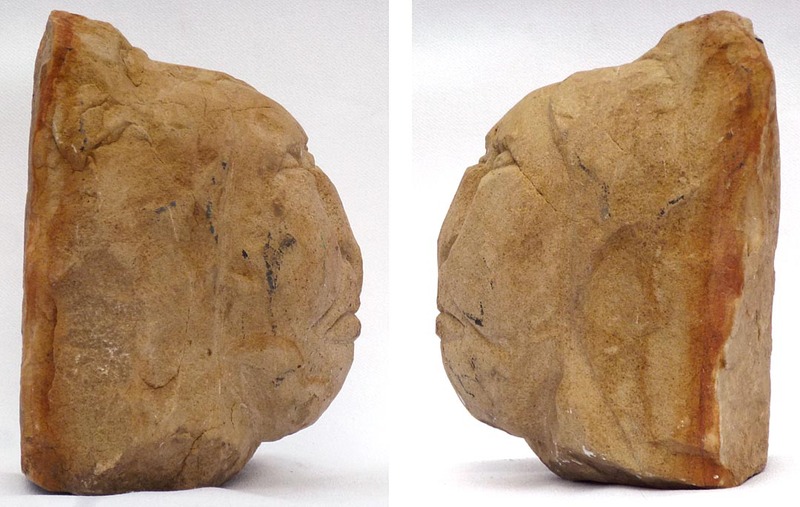 Stone carving ... Two more views ... Side views ... Back view ... From above ... From below ... With a soda can for scale. 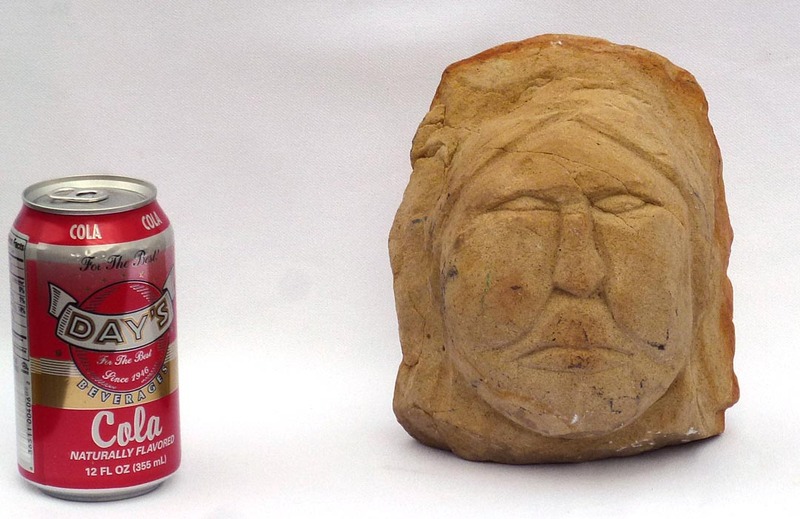 Some much larger photos: Stone carving ... Two more views ... Side views ... Back view ... From above ... From below ... With a soda can for scale. 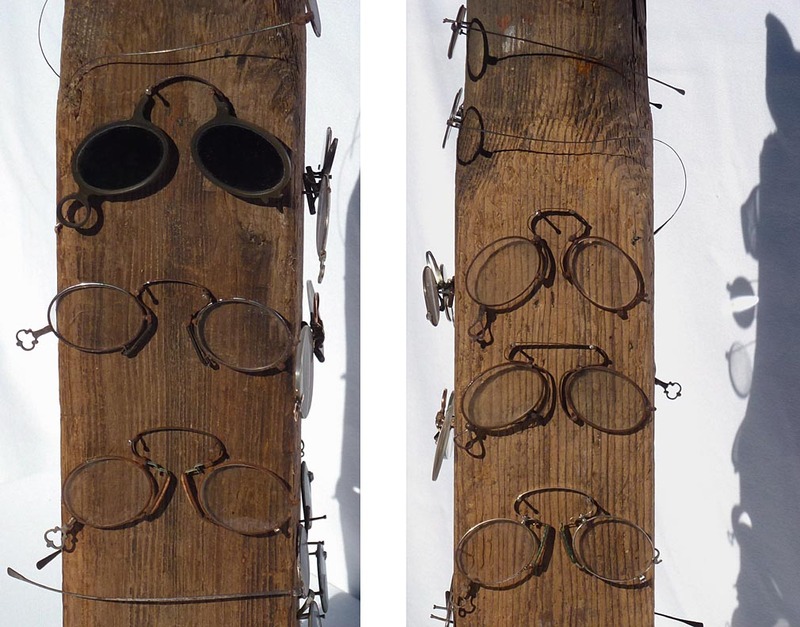 This is a collection of 15 pairs of antique eyeglasses and goggles. 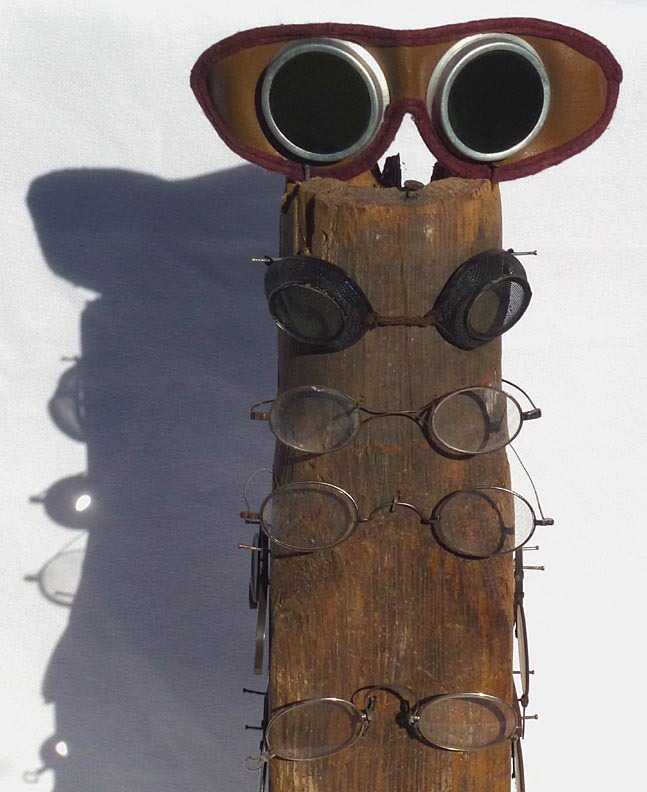 They include pince-nez, one pair of bifocals, steampunk-style safety goggles with wire mesh sides, and a pair of leather driving goggles with dark lenses. 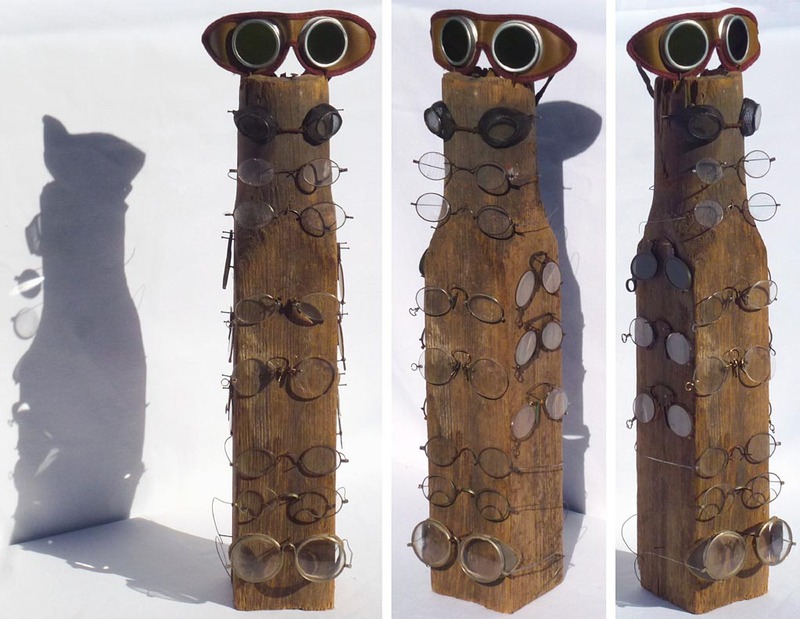 Individual glasses range from about 3 1/2" to 7" wide. 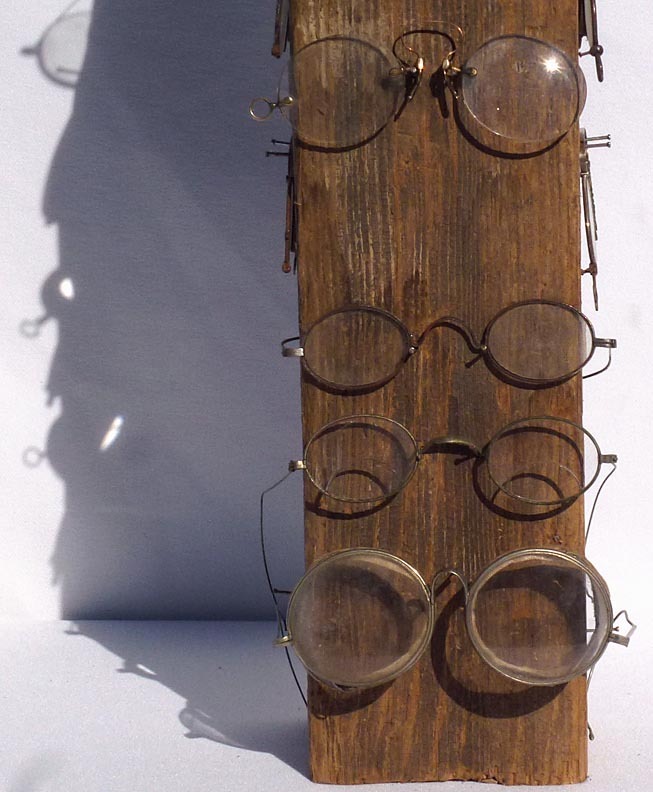 They are on a display mount made from a very old, weathered piece of wood. 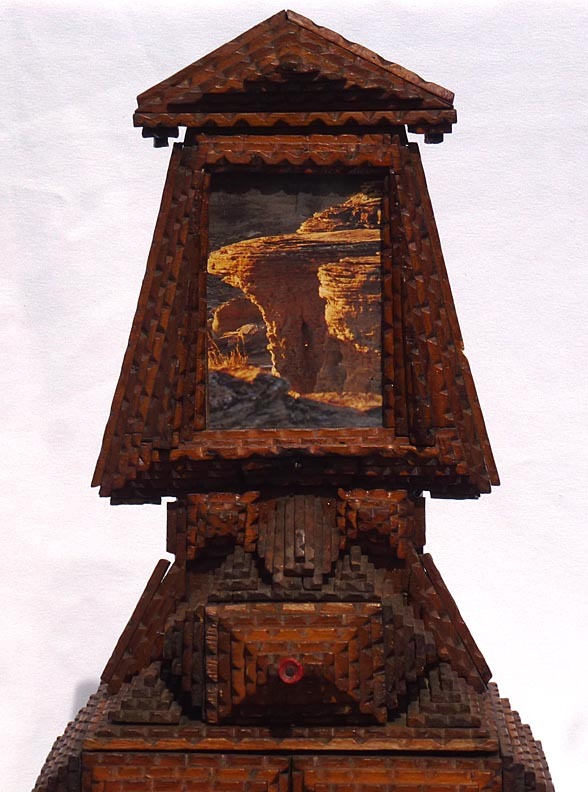 The whole assemblage as mounted is 22" tall by about 4 1/2" by 4 1/2". The price is $295.00. Inventory Code: CSTO. 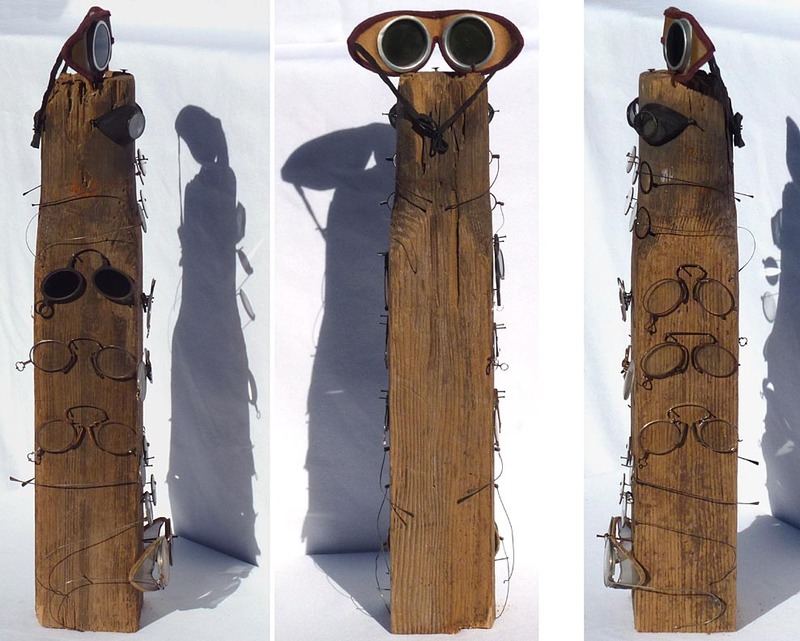 Collection of antique eyeglasses ... Side and back views ... Closeup ... Another closeup ... Closeups of sides ... Closeup of back ... From above ... Another view from above ... With a soda can for scale. 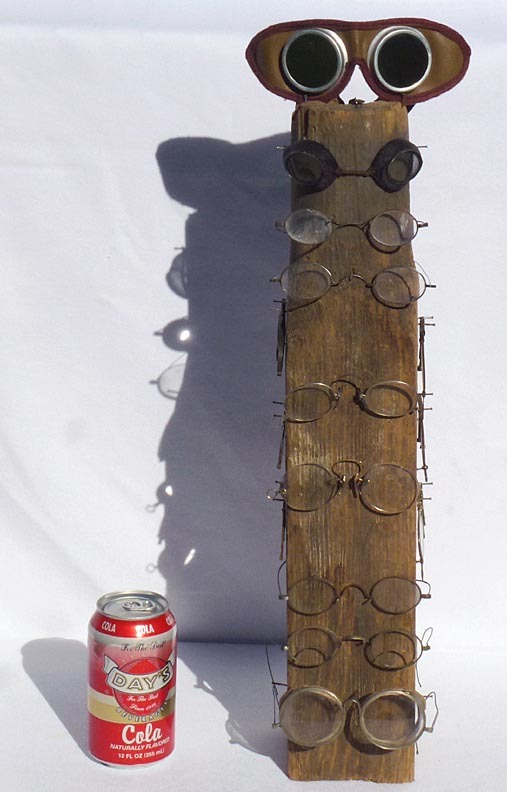 Some much larger photos: Collection of antique eyeglasses ... Side and back views ... Closeup ... Another closeup ... Closeups of sides ... Closeup of back ... From above ... Another view from above ... With a soda can for scale. 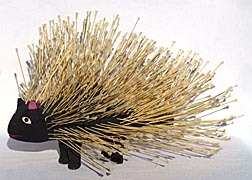 This is a folk art porcupine. 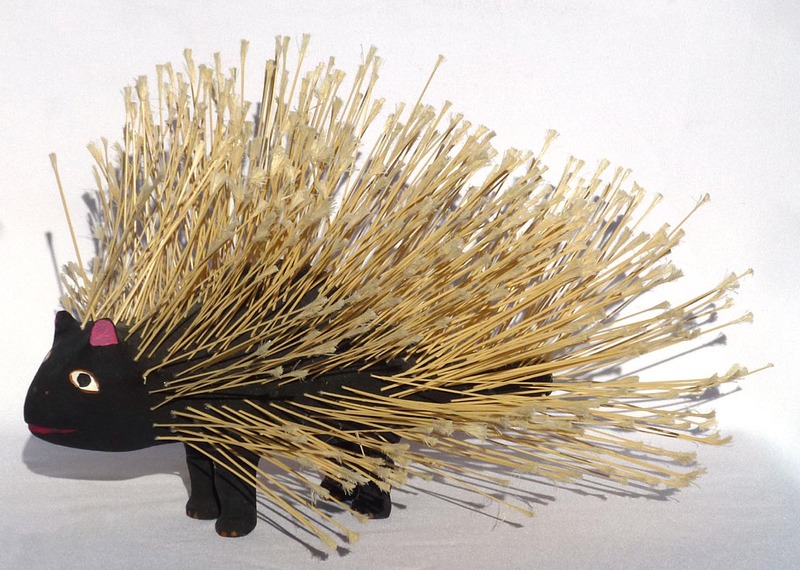 The body is carved from wood and painted, with long stiff nylon or synthetic quills each individually glued into small holes in the back and sides. 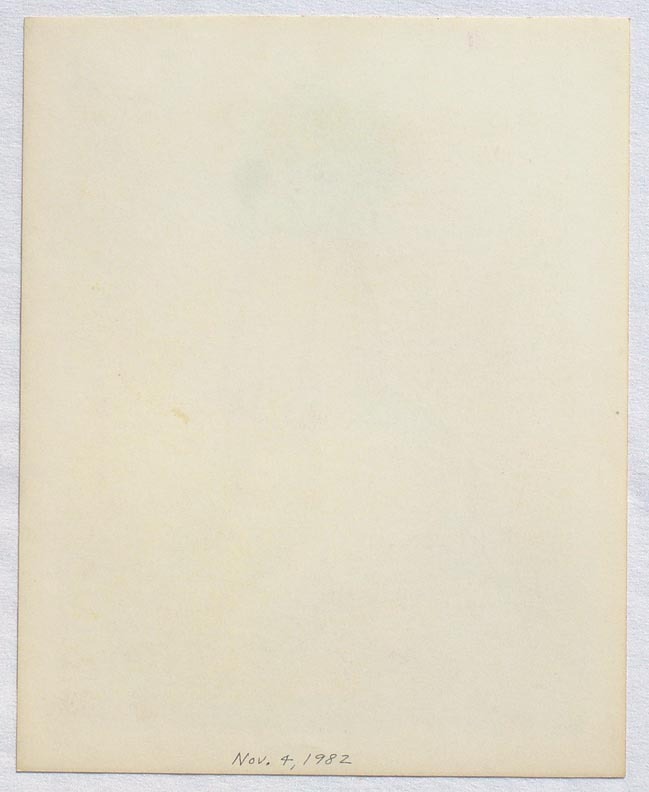 There is a faint, illegible signature underneath: "David" something. 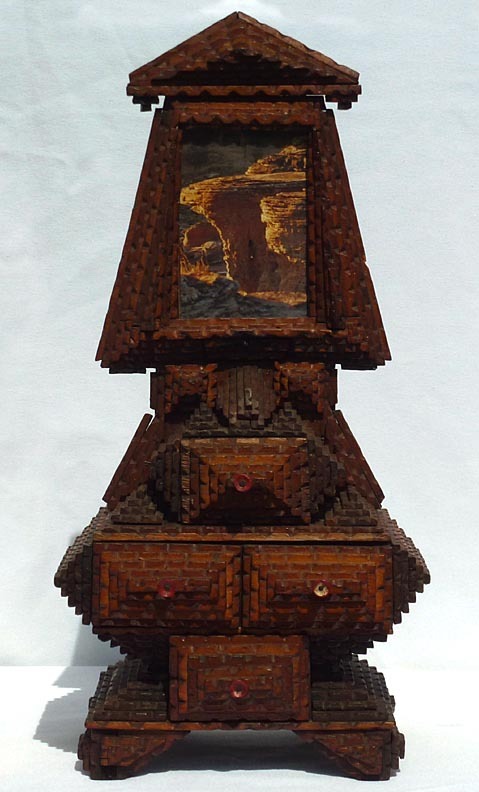 This is likely by David Alvarez, who learned and worked with the famous wood carver, Felipe Archuleta. 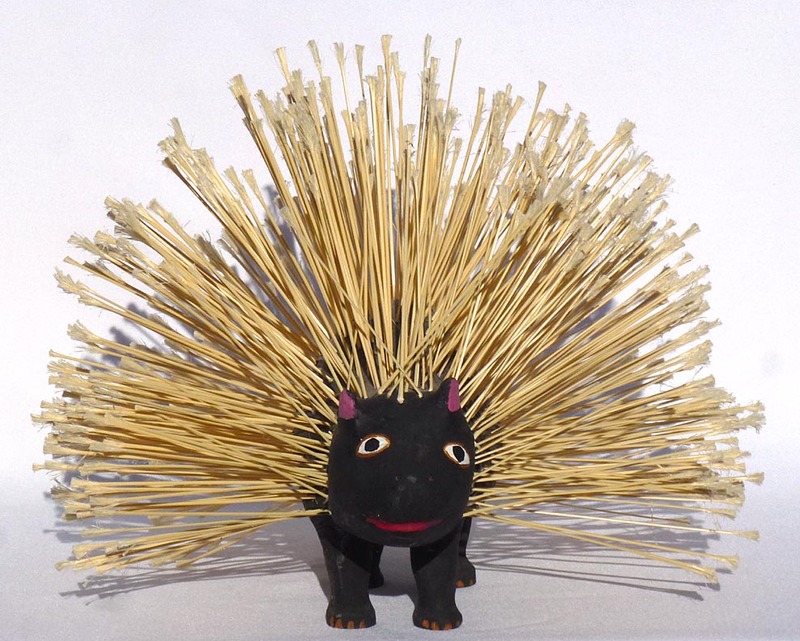 Alvarez has a similar porcupine in the American Folk Art Museum. 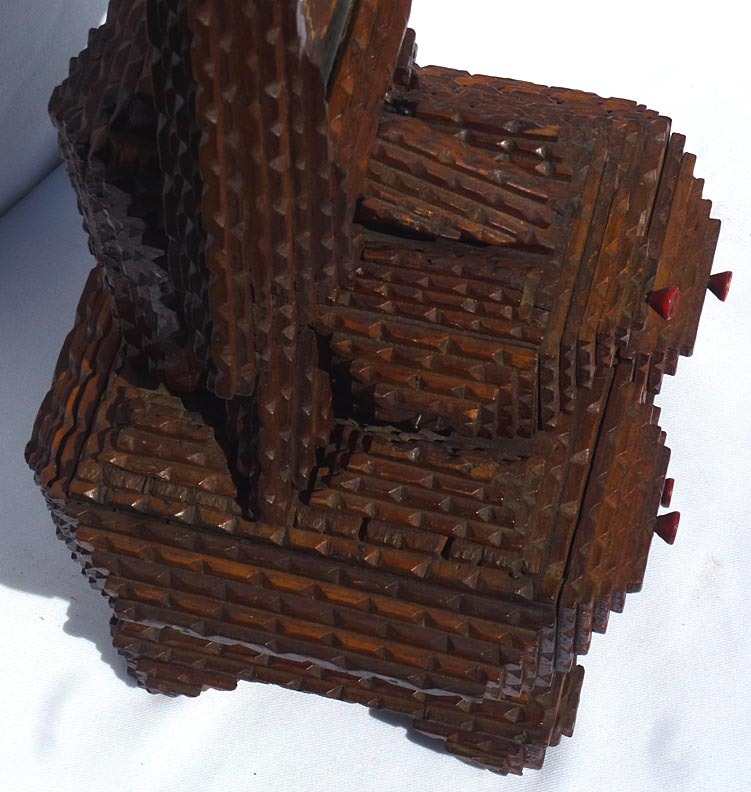 This piece is 17 1/2" long by 13" wide by 10" high, in excellent condition. Age is late 20th or early 21st c. The price is $150.00. Inventory Code: CHCR. 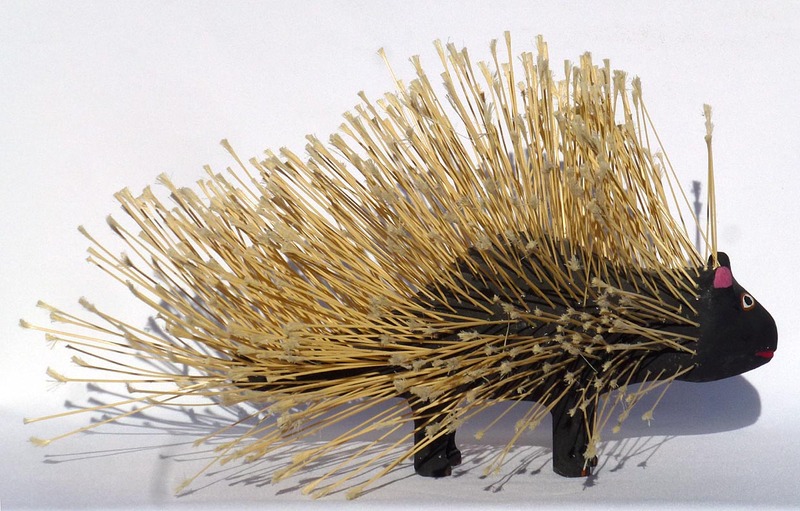 Folk art porcupine ... Side view ... Front view ... Another angle ... Back view ... From above ... From below ... With a soda can for scale. 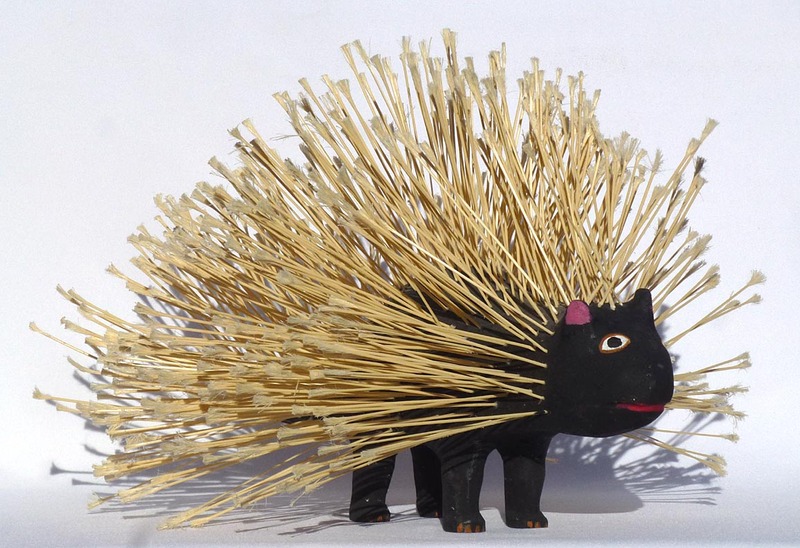 Some much larger photos: Folk art porcupine ... Side view ... Front view ... Another angle ... Back view ... From above ... From below ... With a soda can for scale. Your information is confidential. We never release it to others. 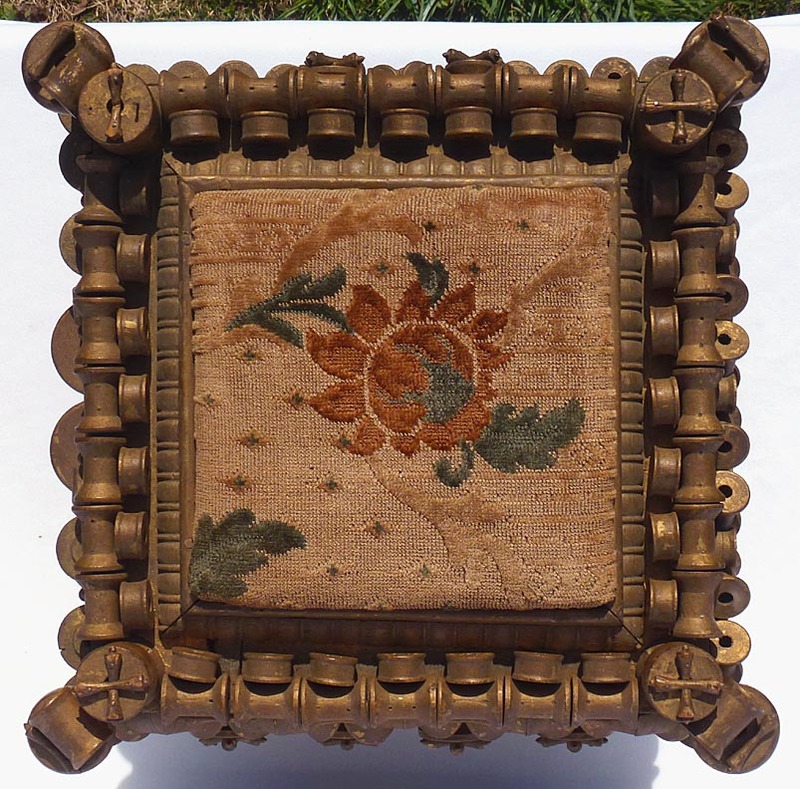 Receive General Updates when we add any antiques or folk art to the site. You will get one email about every two to three weeks.